Thursday 30th April 2015 – 8.45pm – Chris Kowalik. 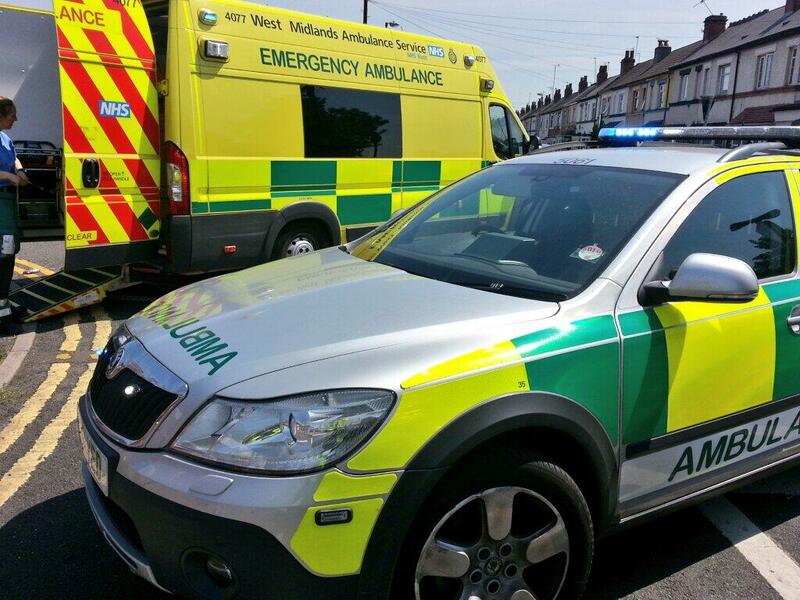 A baby has died following a road traffic collision in Birmingham. West Midlands Ambulance Service was called to Gibbons Road, Selly Oak at 3.55pm today where a car had collided with a wall and a tree. Four ambulances and a senior paramedic officer attended. A West Midlands Ambulance Service spokesman said: “The first ambulance crew to arrive immediately took the baby to Birmingham Children’s Hospital, trying to resuscitate the child with CPR en-route. Sadly, the baby was confirmed dead at hospital. “There were four adults in the car. 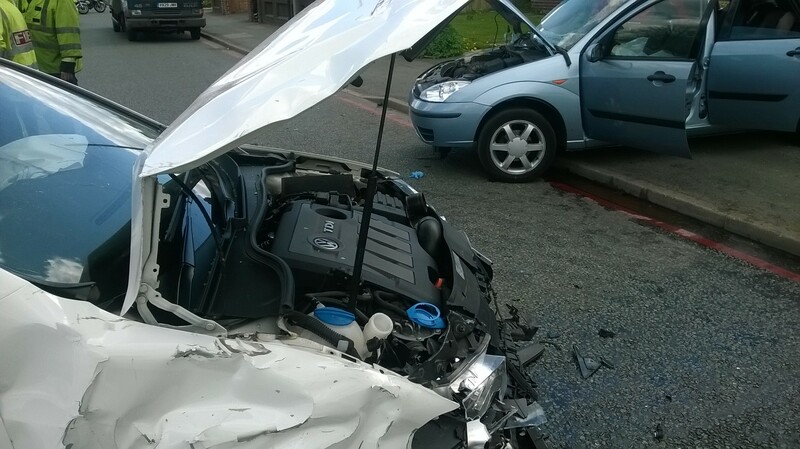 A woman driver who had a head injury was immobilised with the use of a spinal board and neck collar and was taken to Queen Elizabeth Hospital Birmingham. “A woman who was a front seat passenger got herself out of the car with minor injuries and made her own way to a hospital. Wednesday 30th April 2015 – 4pm – Jamie Arrowsmith. A woman has died following a road traffic collision between two cars in Shropshire this afternoon. West Midlands Ambulance Service was called to Station Road, Whitchurch, shortly after 12.45pm. An ambulance, a paramedic area support officer, a paramedic in a rapid response vehicle and the Midlands Air Ambulance from Cosford attended the scene. A West Midlands Ambulance Service spokesman said: “Crews arrived to find CPR already in progress on the woman before they took over to administer advanced life support to try and resuscitate her. “Unfortunately, despite the best efforts of everyone it became apparent that nothing could be done to save her and she was confirmed dead at the scene. We do not have any more details on this incident. Thursday 30th April 2015 – 9.30am – Chris Kowalik. 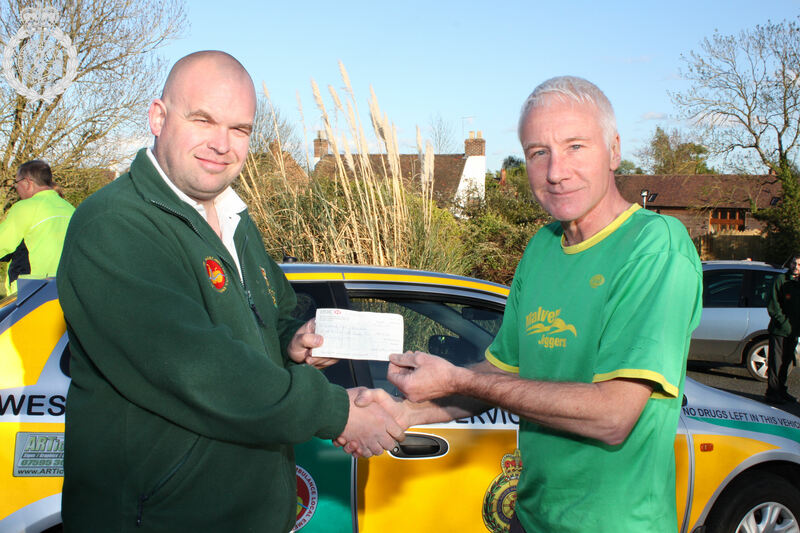 A group of runners jogged up at a pub in Worcestershire last night to present a cheque to local volunteer lifesavers. 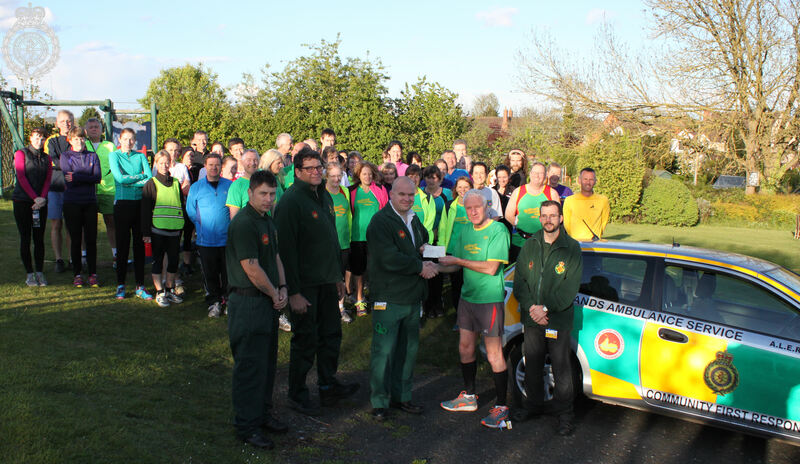 The Malvern Joggers made Worcester Community First Responders their nominated charity last year and raised £872 through a variety of events including a 10km race and a pub-a-thon. For more information about the work of Community First responders, visit www.wmas.nhs.uk, or www.hwcfr.org.uk . Thursday 30th April 2015 – 8.45am – Chris Kowalik. West Midlands Ambulance Service has the equipment and the know-how when it comes to getting people out of hard-to-reach places. A woman was walking her dog in a wooded area in Nuneaton in Warwickshire when she had an epileptic fit and fell seven feet down an embankment. The ambulance service was called to the scene, off Haunchwood Road, shortly before 9.15pm yesterday (Wednesday 29th April). An ambulance crew, a paramedic in a rapid response vehicle and the Hazardous Area Response Team attended. The crew of Warwickshire and Northamptonshire Air Ambulance also attended by rapid response vehicle. A West Midlands Ambulance Service spokesman said: “The woman who is in her 20s only had a slight facial abrasion from the fall but she needed to be carefully moved from the embankment to the ambulance. “First she was immobilised on a scoop stretcher. Then crews lined up the bank and used a ‘caterpillar’ technique to pass the stretcher up the bank. She was then placed on a wheeled device called a ‘bran’ carrier which was used to take her to the waiting ambulance. Thursday 30th April 2015 – 6.00am – Murray MacGregor. 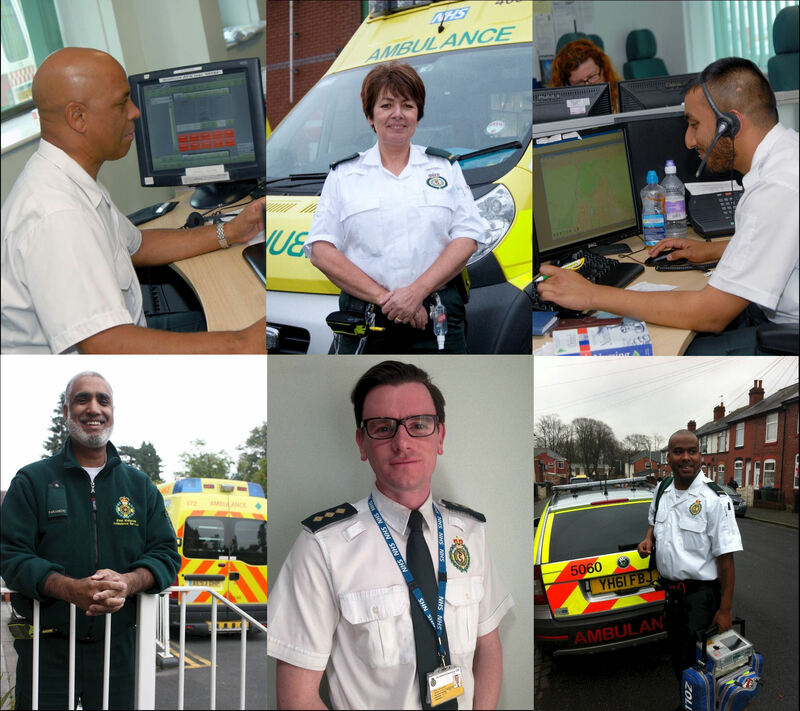 New figures show that West Midlands Ambulance Service is the highest performing ambulance trust in the country. Provisional figures show that WMAS came top, out of the ten Trusts, in two of the four target categories, was second in a third category and narrowly came third in the fourth. Clearly, if we are to get to the most important calls quickly, answering 999 calls in a timely manner is vital. The Trust came top in this category answering over 97% of calls within five seconds; our average call answering time is less than one second. In the category for getting an ambulance to the most serious calls (A19), the Trust achieved a score of almost 97% against a target of 95%. We came second by less than one percentage point. For Red 2 calls, the Trust narrowly missed the target of achieving 75% with a score of over 74%. No Trusts achieved the 75% mark. WMAS Chief Executive, Anthony Marsh, said: “There is no doubt that 2014-15 was an incredibly challenging year for all ambulance services, with rapidly rising demand and continued delays at hospital which have a hugely adverse impact on our ability to get to patients. “Despite that, the fact that we have done so well is testament to the incredibly hard working staff of the Trust. “However, getting to patients quickly is only part of the story. The level of clinical care that our staff have given to the patients they have treated is second to none. In many respects this is far more important than speed of response. “Whilst this is an excellent level of performance, we are in no way complacent and are the first to admit that we can make further changes to the service we deliver. “We are continuing to move forward with developments that will improve still further the way we treat and support patients. “This includes increasing the number of paramedics we have and taking more patients to alternative care settings other than A&E. Currently, only around 55% of those patients we go out to end up going to hospital and that number is continuing to fall. Wednesday 29thApril 2015 – 9pm – Chris Kowalik. 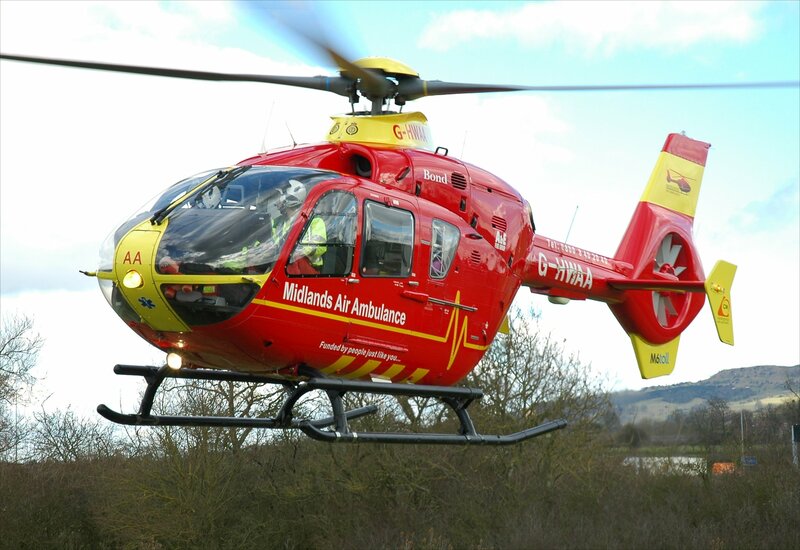 A 15 year old boy has been flown to Birmingham Children’s Hospital following a collision with a heavy goods vehicle in Wolverhampton. West Midlands Ambulance Service was called to Thorneycroft Lane in the Heath Town area of the city shortly after 4.05pm today. Two ambulances and the Midlands Air Ambulance from Cosford attended. Wednesday 29th April 2015 – 5pm – Steve Parry. As industrial fires go this was a large blaze with a billowing smoke plume visible from as far away as Worcestershire and Staffordshire. 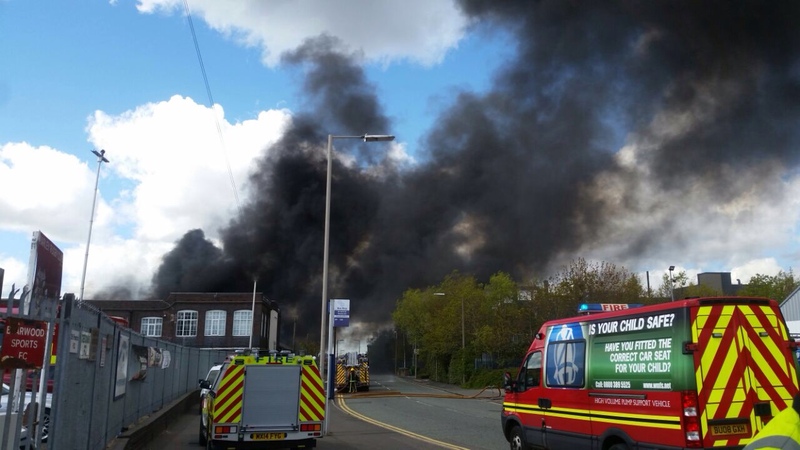 A passing ambulance was first to alert emergency services to the fire at a plastics factory in Tat Bank Road, Oldbury at just after 1.30pm today. West Midlands Ambulance Service responded members of the Hazardous Area Response Team, the HART Command and Control vehicle, together with an ambulance and paramedic supports officers to the scene. 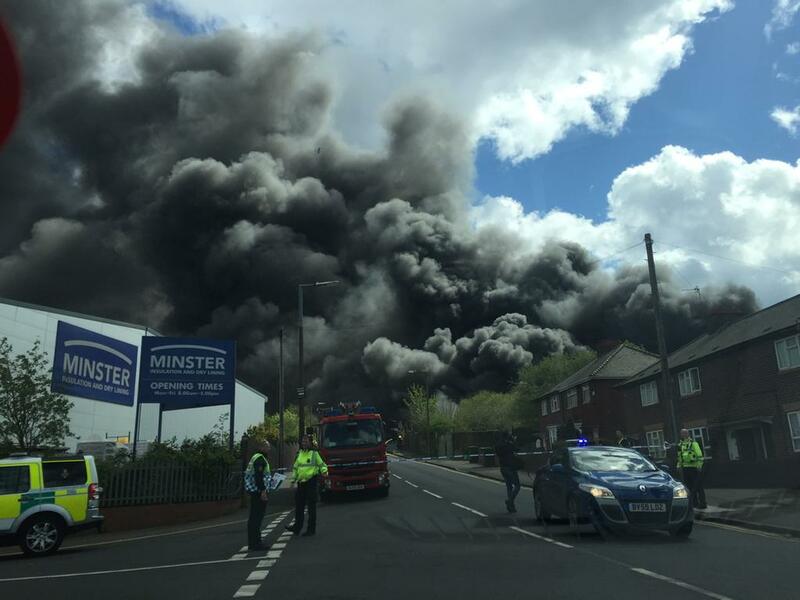 A West Midlands Ambulance Service spokesman said: “Crews were responded to a large industrial fire at just before 1.30pm today after an ambulance crew came across the incident and reported a large fire to ambulance control. “Thankfully, no one was reported injured as a result of the fire. 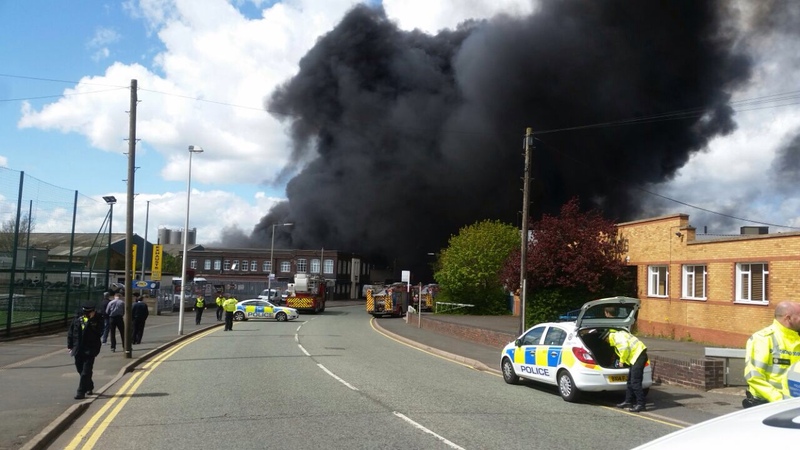 However, as the fire took hold the local community were advised to stay indoors as a health and welfare safeguard. 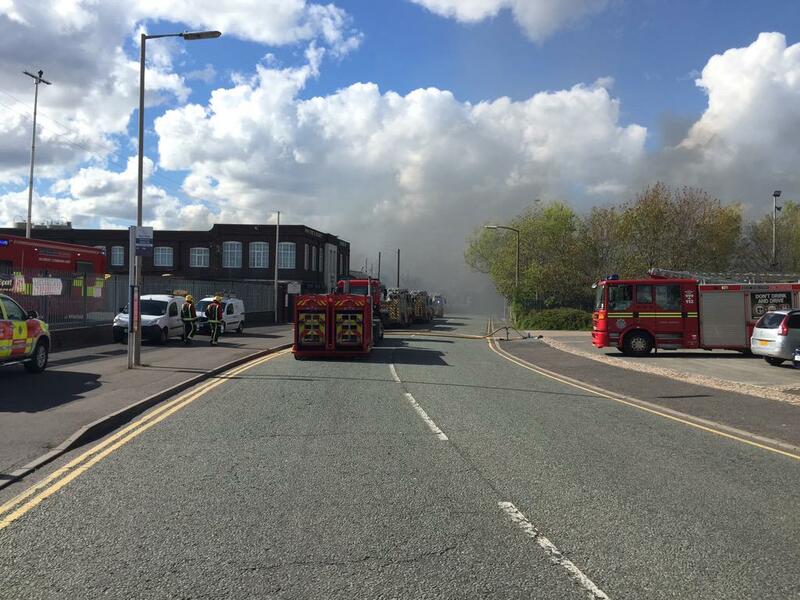 The fire was eventually brought under control and ambulance resources were scaled back at just after 4.30pm. Tuesday 28th April 2015 – 7.00pm – Murray MacGregor. Suffering a heart attack is never good news, but when it happens at least a mile from the nearest road and along a muddy canal tow path as the light fades, it adds an extra complexity to the care that is needed. That was the situation at around 7.45pm on Monday night for a 51 year old Bloxwich man who was on the tow path beside the canal that runs between Freeth Bridge and Stoney Lane Bridge in Bloxwich. Initially two ambulances were dispatched to the scene. A West Midlands Ambulance Service spokesman said: “The first crew to arrive had carried all of their equipment to the scene and diagnosed that the man was having a heart attack and started treatment, but clearly the priority was to get him to hospital as quickly as possible; no easy task, given the situation. 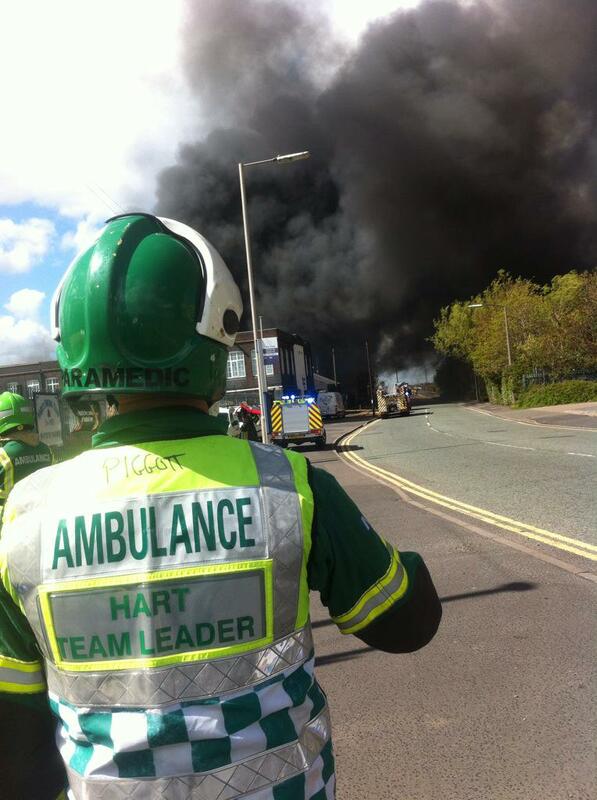 “They requested assistance from HART, the Hazardous Area response Team who were immediately mobilised. “The man was placed on a scoop stretcher that the second crew had brought with them and between them, the two ambulance crews started to carry the man along the muddy tow path. “Thankfully, before too long the HART team arrived with a specialist wheeled stretcher designed to go across rough ground and assisted to get the man back to the ambulance. “Not only did they provide extra hands, but also lighting to make the journey safer given the light was pretty much gone. Unfortunately, we do not have an up to date condition for the man, but the crew described him as doing well when he arrived at the hospital. Tuesday 28th April 2015 – 6.25am – Murray MacGregor. A man who was riding a powered child’s scooter was dragged along by a car after a collision late last night. The incident happened at about 11.30pm on Monday night on the B5030 Uttoxeter to Rocester road about ½ mile out of Rocester by JCB factory. A community first responder from the Mayfield and Ellastone scheme was first on scene who was backed up by a rapid response vehicle, an ambulance, a paramedic area support officer, two BASICS doctors and the MERIT trauma doctor. A West Midlands Ambulance Service spokesman said: “A 29 year old man was riding on a motorised child’s scooter when he was in collision with a car. “He was carried some distance by the car along with the scooter causing significant damage to the bonnet, windscreen and roof of the car. “It was pitch black at the scene and crews had to use lighting as they treated the rider. “The man had suffered significant head and abdominal injuries and a badly broken leg. “He was anaesthetised at the scene, immobilised and had his leg splinted before he was taken on blue lights to the Major Trauma Centre at Royal Stoke University Hospital, where on arrival he was described as being in a ‘critical’ condition. Monday 27th April 2015 – 4.10pm – Jamie Arrowsmith. 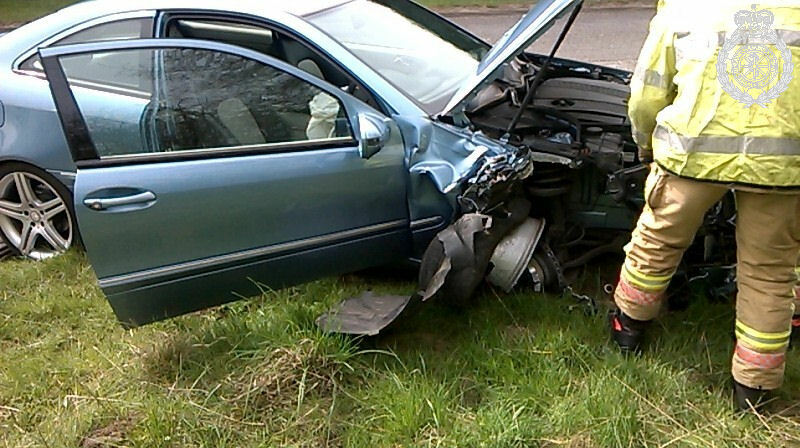 A young girl has been ejected from a car during a two-vehicle collision in Tipton which also left a woman trapped for 50 minutes. The incident took place on Park Lane West shortly after 1.15pm and West Midlands Ambulance Service sent three ambulances, a paramedic area support officer, a senior paramedic officer and the Midlands Air Ambulance from Cosford to the scene. A West Midlands Ambulance service spokesman said: “Ambulance crews arrived to find two cars that had been in collision, one with front end damage and one with damage to the side of the vehicle. “Crews were told that a three-year-old girl had been ejected from the vehicle with damage to its side, but she had been comforted and cared for by bystanders before they arrived. “She was assessed and treated for a head injury, as well as neck and back pain, before being taken to Birmingham Children’s Hospital by land ambulance. Thankfully her injuries are not thought to be life threatening. “From the same car, the driver – a woman in her 20s, was physically trapped as a result of the collision and crews had to work closely with the fire service to carefully cut her free. A procedure which took approximately 50 minutes. “She was treated for a suspected pelvis injury and back pain and given pain relief before being transported to Queen Elizabeth Hospital, Birmingham by land ambulance. “A third patient from the car, a one-year-old boy, was uninjured in the collision but taken to Birmingham Children’s Hospital as a precaution. Monday 27th April 2015 – 3.30pm – Murray MacGregor. 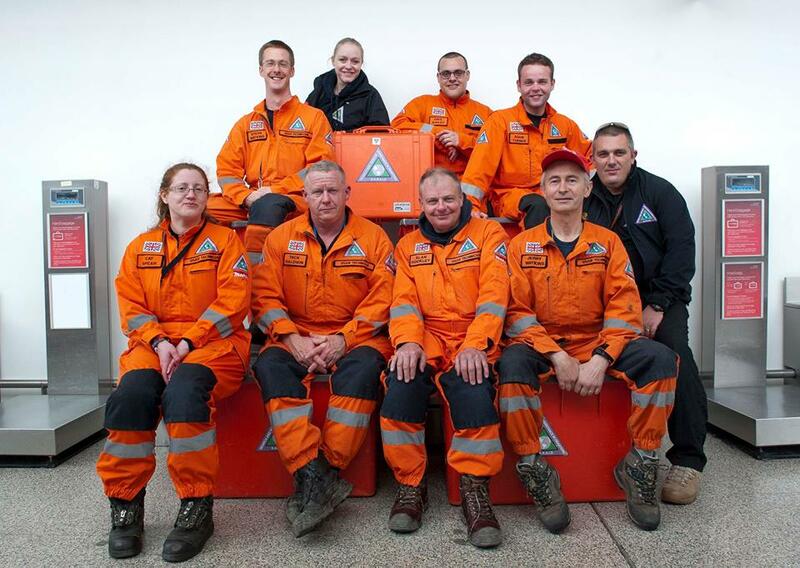 Three members of staff with West Midlands Ambulance Service are en-route to Nepal to assist in the humanitarian rescue operation. It follows the powerful earthquake which measured 7.9 on the Richter Scale which hit 80 kilometres northwest of the capital Kathmandu on Saturday. Latest estimates suggest thousands of people have died with many more still trapped. Time is of the essence in such a rescue missions. Dr Russell is a Medical Incident Officer with the Trust as well as a BASICS emergency doctor with Mercia Accident Rescue Service in Herefordshire. He is also Medical Director, Urban Search and Rescue Medical Team (UMT) of the UK International Search and Rescue team (UK ISAR). He flew out yesterday, Sunday, along with a team of 67 fire-fighters / medics, 4 dogs and over a tonne of heavy rescue equipment. 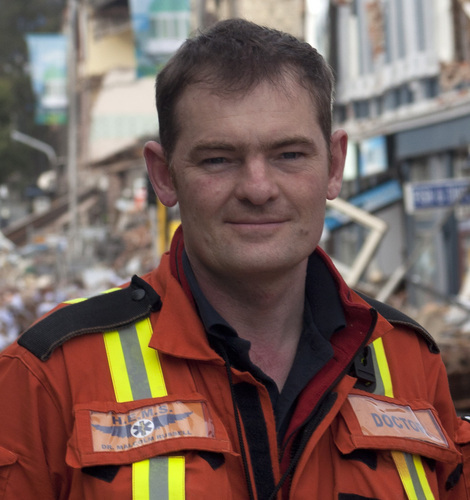 He has experience of the Christchurch earthquake and Japanese tsunami. 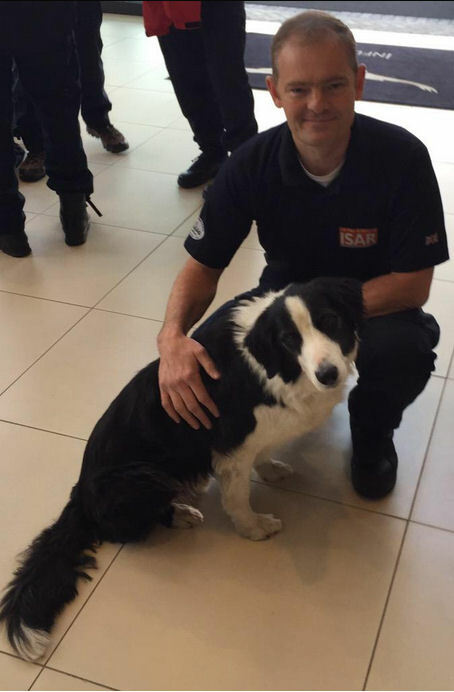 Stoke based Steve Watkins is a member of the S.A.R.A.I.D (Search and Rescue Assistance In Disasters) and is currently en-route to Nepal. He flew out from Heathrow yesterday. As a Hazardous Area Response Team paramedic based at Oldbury, Simon is ideally placed to provide assistance as part of his training is working in confined spaces and collapsed buildings. He is going out with Humanity First Medical who provide medical teams to disasters. He’s been a part of HFM says he feels very passionate about responding as he will be able to put his skills and experience to good use in helping people in their time of need. He is due to fly out today, Monday. Trust Chief Executive, Anthony Marsh, said: “Our good wishes go with all three of them as they go into what will undoubtedly be an horrific scene. “They will, as part of the relief effort, be able to provide invaluable assistance to local communities in the stricken areas. Monday 27th April 2015 – 10.56am – Murray MacGregor. Two people have been taken to hospital after two crashes on either side of the M42 that saw one car slide along on its roof for approximately 100 metres. The crashes happened between junctions 1 and 2 of the motorway at between 8.15am and 8.20am. A rapid response vehicle came across the first crash on the northbound carriageway just moments after it had happened. As the paramedic was treating the two patients from the first incident, the second happened on the southbound carriageway about 500 metres away. He was backed up by a further rapid response vehicle, two ambulances and a paramedic area support officer. A West Midlands Ambulance Service spokesman said: “On arrival, the paramedic found a two vehicle nose to tail crash that had happened in lane 3. Both cars had suffered fairly significant damage. 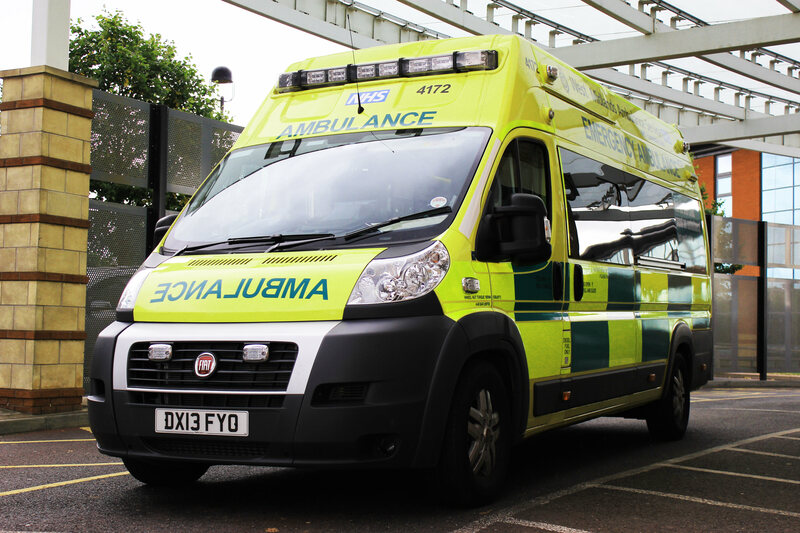 “A woman in her 50s in the rear vehicle was immobilised using a neck collar and spinal board as a precaution before being taken to the Alexandra Hospital in Redditch. “The man from the car in front, who was in his 30s, was uninjured. “While the paramedic was treating the woman from the first incident, he heard a ‘massive crash’ and looked up to see a car on its roof on the opposite carriageway about 500 metres away. “After ensuring the first patient was safe, he picked up his medical bag and ran down the carriageway to the other crash. “He said the car on it’s roof had ended up about 100 metres away from the impact point and was against the central reservation. “Thankfully, the driver, a woman in her 40s was not seriously injured. She was complaining of head and neck pain. She too was immobilised before being taken to the same hospital. “The driver of the other car involved that had significant rear end damage was uninjured. “The paramedic said, undoubtedly the level of injuries would have been more significant had all of the drivers not been wearing seatbelts and been protected by the airbags in their vehicles. Sunday 26th April 2015 – 8.30pm – Jamie Arrowsmith. A man was thrown approximately 5m from a quad bike and subsequently taken to one of the region’s major trauma centres following a road traffic collision in Tipton this afternoon. The incident occurred near to the Gospel Oak public house on Gospel Oak Road just before 5.25pm and West Midlands Ambulance Service sent an ambulance, a paramedic in a rapid response vehicle, a paramedic area support officer and the Midlands Air Ambulance from Cosford, with a doctor on board, to the scene. A West Midlands Ambulance Service spokesman said: “On arrival, crews discovered a car and a quad bike that had been in collision. “A man in his 20s, who is believed to be the passenger, was thrown around 5m from the quad in the incident. “It is believed he was not wearing a helmet at the time and had suffered a significant head injury which was contributing towards a reduced level of consciousness. “He was also treated for a fractured leg and was immobilised with the use of a leg splint. 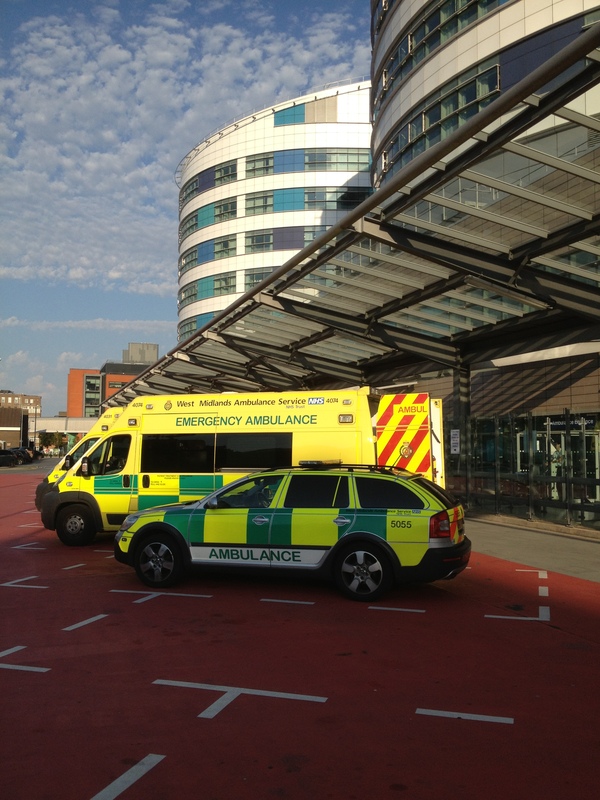 The doctor administered pain relief before the man was taken to the major trauma centre at Queen Elizabeth Hospital Birmingham by land ambulance. 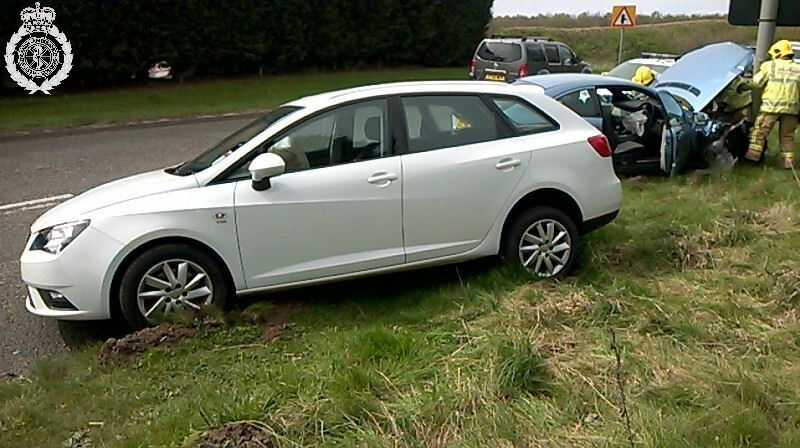 “The driver of the car, a man, was assessed at scene but was uninjured in the incident. Sunday 26th April 2015 – 8.25pm – Jamie Arrowsmith. A man has been airlifted to one of the region’s major trauma centres after colliding with a tree during a motorcross event in Daventry this afternoon. The incident occurred at Shuckburgh Hill in Park Lane, shortly after 12.20pm and West Midlands Ambulance Service sent a community paramedic and the Warwickshire and Northamptonshire Air Ambulance to the scene. A West Midlands Ambulance Service spokesman said: “Crews arrived to find a motorcross rider who had collided with a tree. “The man, believed to be in his 50s, was treated by ambulance staff for a head injury suffered in the incident. “He remained conscious throughout but was also treated for some breathing difficulties he was experiencing. Sunday 26thth April 2015 – 8.20pm – Jamie Arrowsmith. A car overturned and a woman was airlifted to hospital following a two-car road traffic collision in Stoke-on-Trent this morning. West Midlands Ambulance Service was called to Gallows Green in Alton, shortly after 9.15am and sent two ambulances, a community paramedic, a community first responder, a BASICS doctor and the Midlands Air Ambulance from Staffordshire to the scene. A West Midlands Ambulance Service spokesman said: “Crews arrived to find two cars that had been in collision, one with front end damage and one with rear end damage. The car with front end damage had overturned in the incident and come to rest on its side. “From the car with rear end damage, there was a female patient, believed to be in her 20s. “She had managed to free herself from the vehicle and was treated by ambulance crews for injuries to her shoulder and hip. “She was immobilised with the use of a pelvic binder and given pain relief before being airlifted to Royal Stoke University Hospital. Sunday 26thth April 2015 – 5.30pm – Jamie Arrowsmith. A motorcyclist has been anaethetised and airlifted to one of the region’s major trauma centres after suffering serious injuries following a collision with street furniture in Much Wenlock this afternoon. West Midlands Ambulance Service was called to the B4368, near to Weston Junction, shortly after 3.15pm and sent an ambulance, a paramedic area support officer and the Midlands Air Ambulance from Cosford to the scene. A West Midlands Ambulance Service spokesman said: “Crews arrived to find a man who had reportedly fallen from his motorbike before colliding with a road sign. The motorbike was found in a nearby hedge. An off duty nurse was already on scene and supported ambulance staff throughout. “The man, believed to be in his 20s, was treated by ambulance staff for a serious head injury and a suspected fractured jaw. He was also treated for injuries to his face and chest and was suffering from a reduced level of consciousness. “Due to the serious nature of his condition, he was anaesthetised and immobilised with the use of a pelvic splint and scoop stretcher. Sunday 26th April 2015 – 10.45am – Jamie Arrowsmith. A man is lucky to be alive after his car suffered significant damage and landed on it’s roof following a collision with a brick wall in Southam this morning. West Midlands Ambulance Service was called to Leamington Road at 7.40am and sent an ambulance, a paramedic area support officer, a community paramedic and the Warwickshire and Northamptonshire Air Ambulance to the scene. A West Midlands Ambulance Service spokesman said: “On arrival, crews discovered a car on its roof that had suffered significant damage following a collision with a brick wall and street furniture. “The man, believed to be in his 20s, was conscious throughout but mechanically trapped as a result of the collision. Crews worked closely with the fire service to free the man from the vehicle, a process which took approximately 25 minutes. “He was treated for multiple injuries, including to his head, chest and pelvis. He had also suffered suspected fractures to his sternum and leg. 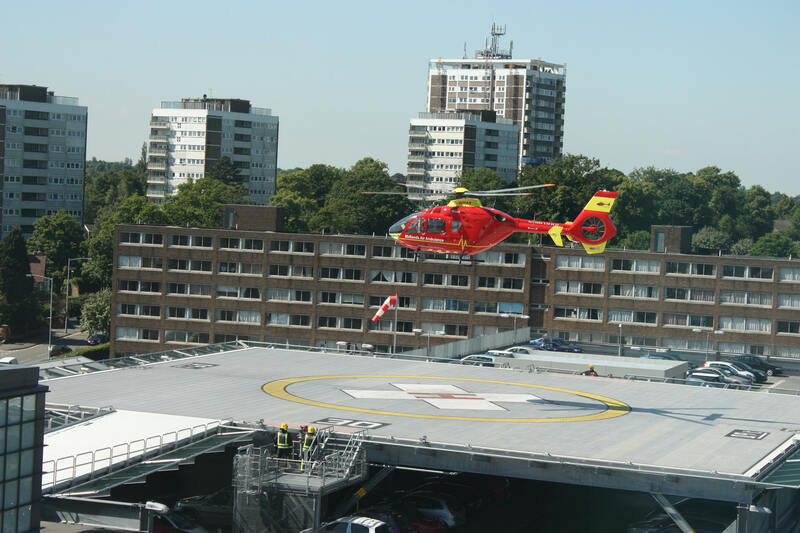 “The man was fully immobilised with the use of a scoop stretcher and pelvic splint and given pain relief before being air lifted to University Hospital Coventry and Warwickshire. “Given the nature of the collision and the amount of injuries sustained, the man is fortunate to be alive. 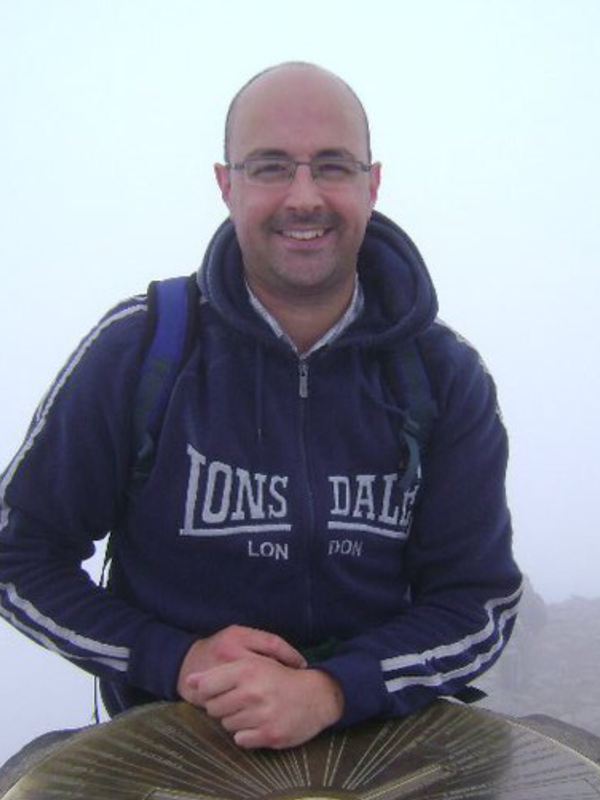 Sunday 26th April 2015 – 9.45am – Jamie Arrowsmith. 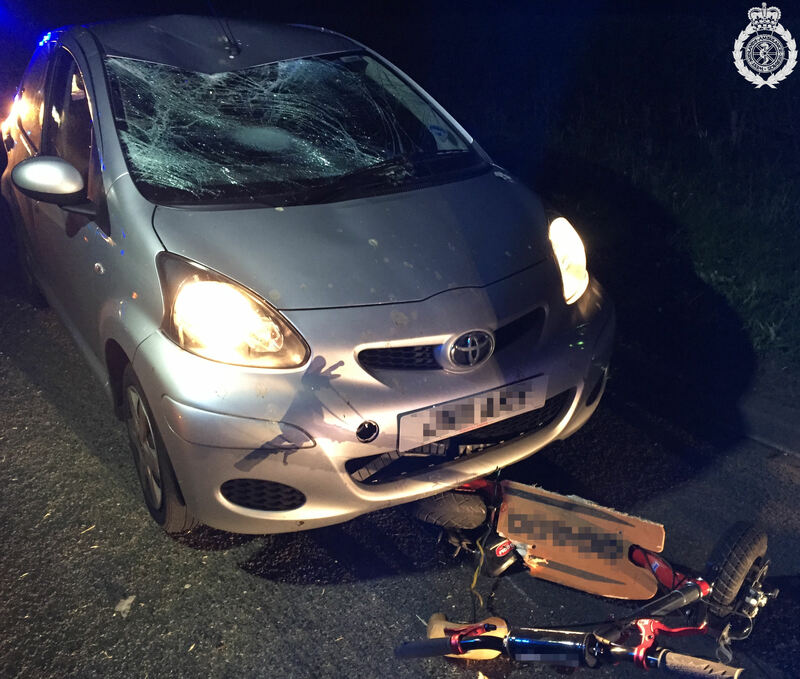 A motorcyclist ended up underneath a car following a road traffic collision in Bilston last night. West Midlands Ambulance Service was called to Oxford Street, near to the Midland Pool and Snooker club, shortly before 10.55pm. An ambulance, a paramedic in a rapid response vehicle, a paramedic area support officer and the West Midlands CARE Team attended. 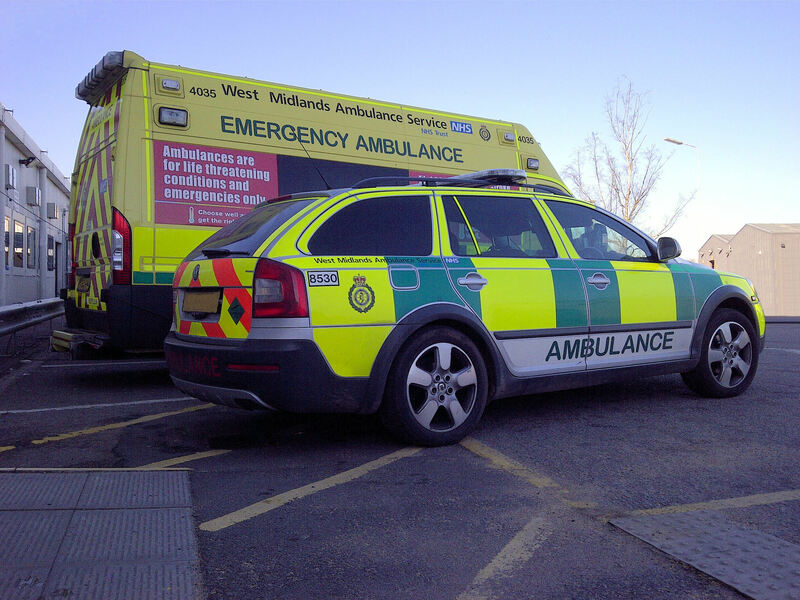 A West Midlands Ambulance Service spokesman said: “On arrival, crews discovered a motorcyclist underneath a car following a collision between the two vehicles. It is unclear whether the wheels of the car had gone over the man. “In order for ambulance staff to assess and treat the man, the fire service worked quickly to move the car. “Crews were then able to treat the man, believed to be in his 20s, for injuries to his abdomen and pelvis, as well as a fractured left arm. “A pelvic splint was applied and he was fully immobilised. He was also given pain relief before being taken to New Cross Hospital for further treatment. Saturday 25th April 2015 – 11.45pm – Jamie Arrowsmith. Two people have suffered significant burns and have been seriously injured following a flat fire in Birmingham tonight. West Midlands Ambulance Service was called to Fox Hollies Road, Acocks Green at 9.40pm and sent two ambulances, a rapid response paramedic, a MERIT trauma doctor and the West Midlands CARE Team to the scene. A West Midlands Ambulance Service spokesman said: “Upon arrival, ambulance staff discovered two patients outside of the property whilst firefighters continued to tackle the fire. “A woman, believed to be in her late 30s, had suffered significant burns to her head, chest, abdomen, arms and legs. “Due the serious nature of her condition she was anaesthetised and taken to Queen Elizabeth Hospital Birmingham on alert. The MERIT doctor travelled with the woman to continue treatment en-route. “The second patient, a man in his 30s, suffered burns to his hands and face and was having breathing difficulty. Ambulance staff worked quickly to manage his breathing and administer pain relief before transporting him to the same hospital. The CARE Team travelled with the man to continue treatment en-route. Friday 24th April 2015 – 4.45pm – Steve Parry. Two adults and three children have been treated by ambulance staff at the scene of a road traffic collision outside a City school in Birmingham this afternoon. The incident occurred outside Woodgate School in Trimpley Road, at just before 3.30pm. Two ambulances together with a paramedic in a rapid response vehicle and a two paramedic officers attended the scene. 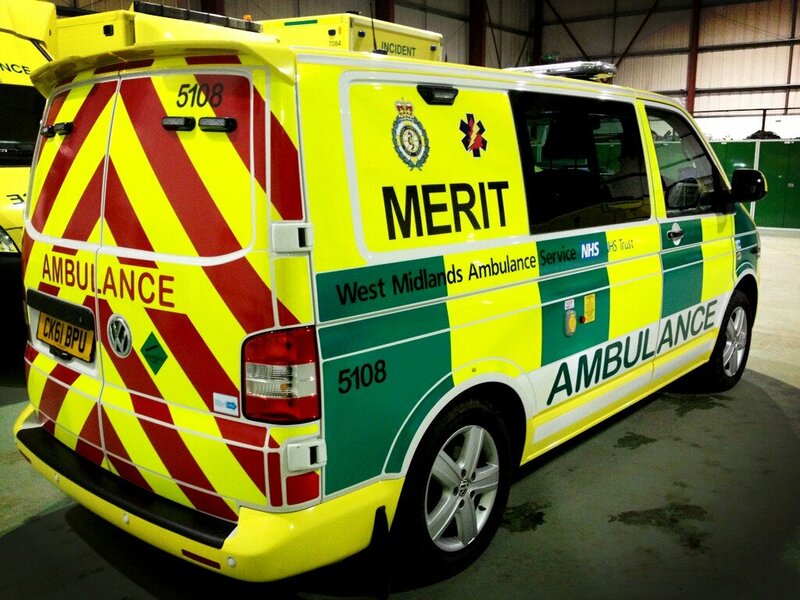 A West Midlands Ambulance Service spokesman said: “Crews were called to an incident involving a car which appears to have rolled backwards injuring two adults and young children. “A five year old male was treated for a serious abdominal and leg injuries. The patient was immobilised and given pain relief before being taken to Birmingham Children’s Hospital for further treatment. “The mother, believed to be in her thirties, was assessed at the scene but was found to be uninjured. She travelled with the five year old child to hospital. Thursday 23rd April 2015 – 5.15pm – Claire Brown. A bus passenger who collapsed in cardiac arrest in Birmingham has been resuscitated by the ambulance service with a helping hand from a local university student this afternoon. West Midlands Ambulance Service was called to a bus heading out of town on the A38 Bristol Road, between Belgrave Middleway and Speedwell Road, shortly before 3.00pm (Thursday) after reports that a passenger had stopped breathing. Two ambulances, a paramedic area support officer and a community paramedic were sent to the scene. A West Midlands Ambulance Service spokeswoman said: “When ambulance staff arrived on the double decker bus they found a man in cardiac arrest on the lower deck. A university student, who was a fellow passenger on the bus, had alerted the bus driver to the unwell man and was administering excellent CPR. “Ambulance staff took over resuscitation efforts from the university student, a young woman, and continued to administer advanced life support on the bus. After a short time, the man’s heart started beating and he began breathing for himself. “The man, who was in a serious condition, was quickly alerted to Queen Elizabeth Hospital Birmingham by ambulance for further emergency treatment. Notes to Editor: I have no more details regarding this incident. Thursday 23rd April 2015 – 3.40pm – Claire Brown. 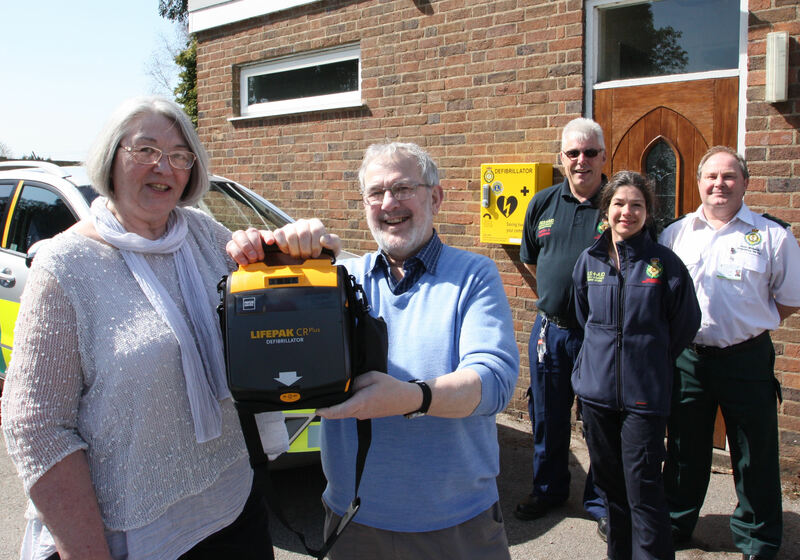 A church hall in a community in Solihull is a saviour for patients in cardiac arrest thanks to a new box of tricks. A community public access defibrillator (CPAD) is a device used to help restart the heart of someone in cardiac arrest. St Peters Church Hall in Holly Lane, Balsall Common, has kindly housed a device which will not only benefit the visitors to the hall and church but also the local community. The life-saving device was funded by West Midlands Ambulance Service and is situated in a secure yellow box on the front of the building which is easily accessible in an emergency. The box itself was purchased by Balsall Common Lions and is the third device to be installed in the village with a fourth due to be unveiled soon. Andy Jeynes, the Trust’s Community Response Manager, said: “With a fourth defibrillator in the pipeline for Balsall Common, you really won’t be far from a life-saving device in this village soon thanks to the support from local businesses, Balsall Common Lions and the dedication of our Fastaid Community First Responders. Notes to Editor: Pictured (left to right) Christine Hornsby, Brian Hornsby, CFRs Jeff Way and Alice Hawkins and Community Response Manager Andy Jeynes. 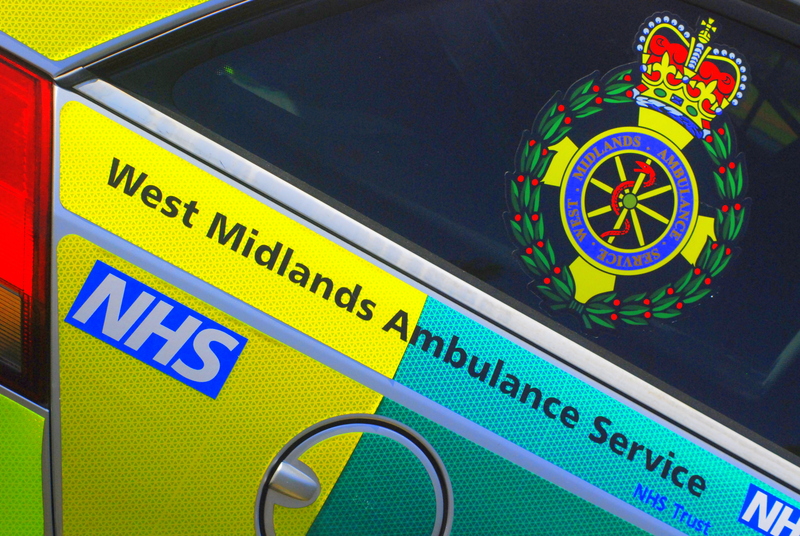 A man has been fined and ordered to pay compensation after assaulting three members of West Midlands Ambulance Service staff. Joshua Mason, 21, from Stafford, was sentenced on March 4th to a fine of £185, ordered to pay £200 in compensation and £100 in costs after pleading guilty to three counts of assault by beating. The incident took place when West Midlands Ambulance Service was called to the junction of Wildwood Drive and Chepstow Drive on July 26th, 2014. All three members of staff were initially treated on scene, though one did receive follow-up hospital care the following day. Reflecting on the incident, Emergency Care Assistant Christopher Shirley, said: “I am pleased to see that both the ambulance service and police have taken such a strong stance regarding this matter. “It is extremely disappointing to suffer physical abuse when we are trying to help members of the public with medical emergencies. Steve Elliker, West Midlands Ambulance Service’s Head of Security and Safety said: “The Trust welcomes the sentence that has been passed on this occasion, it is completely unacceptable that ambulance staff, who are responding to help people who have serious medical conditions or injuries, should have to face violence and verbal abuse. Wednesday 22nd April 2015 – 5.15pm – Jamie Arrowsmith. A man has been fortunate to escape more serious injury after he fell from a horse which subsequently landed on top of him in Leominster this afternoon. West Midlands Ambulance Service was called to the A4110 in Mortimers Cross, near to the Mortimers Cross pub, shortly before 12.50pm and sent an ambulance, a community paramedic in a rapid response vehicle and the Midlands Air Ambulance from Strensham to the scene. A West Midlands Ambulance Service spokesman said: “The man was reportedly thrown backwards from the horse whilst out riding this afternoon. To make matters worse, the horse then briefly fell on top of him. “The man, believed to be in his 60s, was assessed by ambulance staff and treated for suspected fractured ribs. 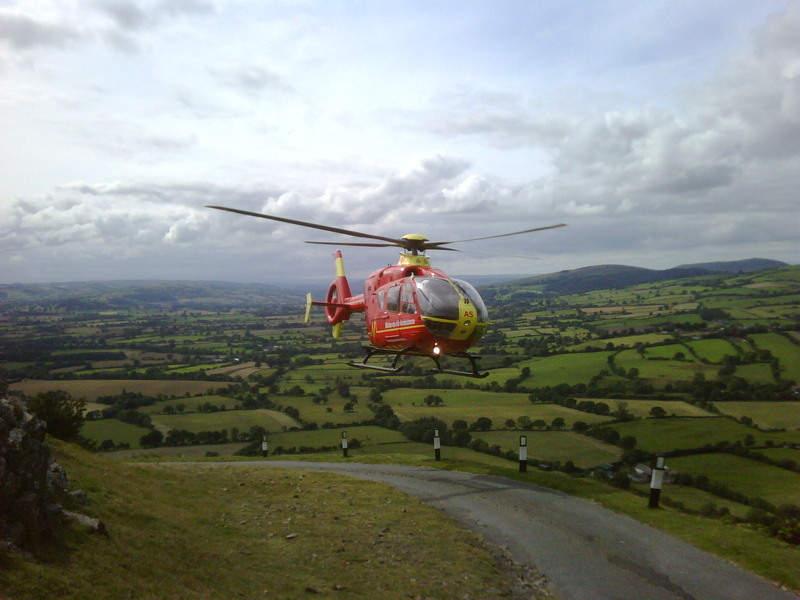 “He was given pain relief to help stabilise his condition before being airlifted to Hereford County Hospital for further treatment. “Considering the man was unlucky enough to have the horse land on top of him after falling himself, he is fortunate to have not suffered more significant injuries in the incident. Tuesday 21st April 2015 – 10pm – Jamie Arrowsmith. A motorcyclist has been treated for a fractured leg and wrist after colliding with the kerb and central reservation in Sutton Coldfield tonight. West Midlands Ambulance Service was called to Lichfield Road in Curdworth shortly before 7pm and sent an ambulance, a rapid response paramedic, a community paramedic, a MERIT trauma doctor and the Midlands Air Ambulance from Staffordshire to the scene. A West Midlands Ambulance Service spokesman said: “The man had reportedly fallen from his bike on the way home from a nearby bikers’ meeting. Crews were told that after losing control of the bike, the man collided with a kerb before also hitting the central reservation. “The biker, believed to be in his 40s, was treated for fractures to his right leg and right wrist. He was given pain relief to stabilise his condition and immobilised with the use of a scoop stretcher. He also had his leg splinted. Tuesday 21st April 2015 – 7.15pm – Murray MacGregor. A moped rider has died after he came off his bike in Staffordshire this afternoon. The incident happened on the A34 at Aston, just south of Stone at around 4.00pm. An off duty paramedic came across the incident shortly after it happened and stopped to provide treatment. She was backed up by two ambulances and a paramedic area support officer. A West Midlands Ambulance Service spokesman said: “When the off duty paramedic arrived, she started CPR on the rider who was in cardiac arrest. Tuesday 21st April 2015 – 9.05am – Murray MacGregor. A man has died after an incident on the A500 in Staffordshire involving an HGV and a cyclist. West Midlands Ambulance Service was called at just after 5.35am to a location on the northbound carriageway between the Porthill and Kidsgrove junctions. A West Midlands Ambulance Service spokesman said: “When crews arrived they found a student first year paramedic providing care to the man. “Unfortunately, the man had suffered very significant injuries. 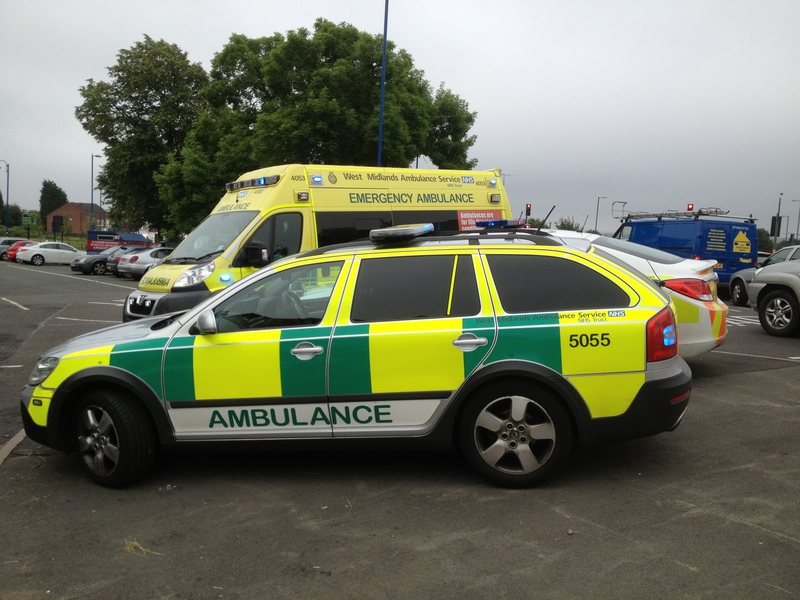 “The crew provided treatment at the scene before taking him on blue lights to Royal Stoke University Hospital. “Sadly, despite all efforts, it was not possible to save the man and he was confirmed dead shortly after arrival. Monday 20th April 2015 – 7.42pm – Murray MacGregor. A young girl has been knocked unconscious after falling about six feet from a climbing frame at a pub. The incident happened at the Glassworks Pub in Camphill, Wordsley at about 6.15pm on Monday evening. A rapid response vehicle was on scene within eight minutes of the call and was backed up by an ambulance, a paramedic area support officer the MERIT Trauma Doctor on the Midlands Air Ambulance from Cosford. A West Midlands Ambulance Service spokesman said: “The girl, who is thought to be four, was playing on the climbing frame when she slipped and fell in a very unfortunate accident. Monday 20th April 2015 – 7.00pm – Murray MacGregor. A quad biker, who wasn’t wearing a helmet, has suffered a serious head injury as well as suffering several fractures after a crash in the Black Country. The incident happened on Lunt Road in Bilston at just before 5.00pm on Monday afternoon. A rapid response vehicle, an ambulance and a paramedic area support officer were initially sent to the scene, before they requested an air ambulance due to the serious nature of the incident. The Midlands Air Ambulance from Staffordshire was then sent to the scene landing at Greenacres School in Lonsdale Road. A West Midlands Ambulance Service spokesman said: “When crews arrived they found a man in his early 20s who had been thrown from a quad bike and landed in a garden. The machine was badly damaged as was a nearby wall and lamppost. “Unfortunately, the patient wasn’t wearing a helmet and was briefly knocked unconscious. “As well as a head injury, the man had suffered a badly broken left leg and a potentially fractured pelvis. “The man was immobilised using a neck collar and spinal board. In addition his leg and pelvis were splinted. 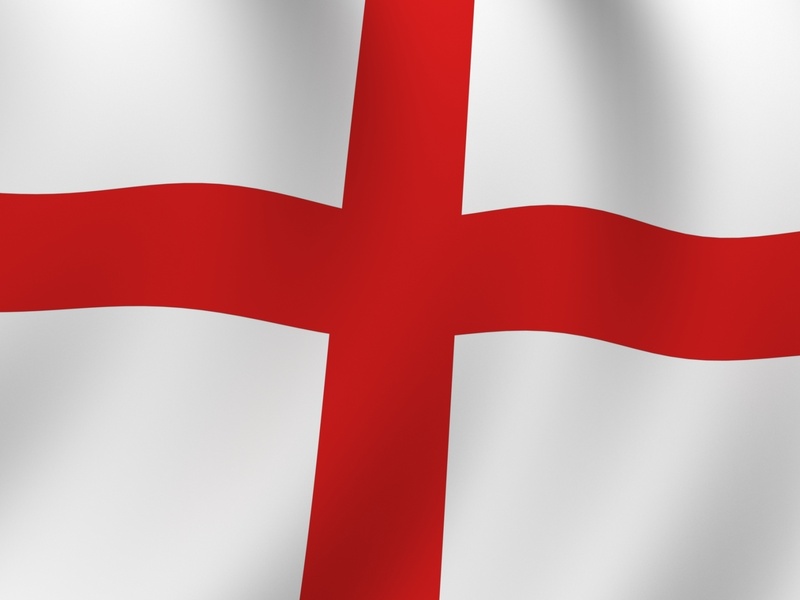 Monday 20th April 2015 – 1.30pm – John Hawker. A schoolgirl has received advanced trauma care by medics after being struck by a car this morning in Rugby. The incident occurred on Leicester Road, near to the retail park at around 8.30am. 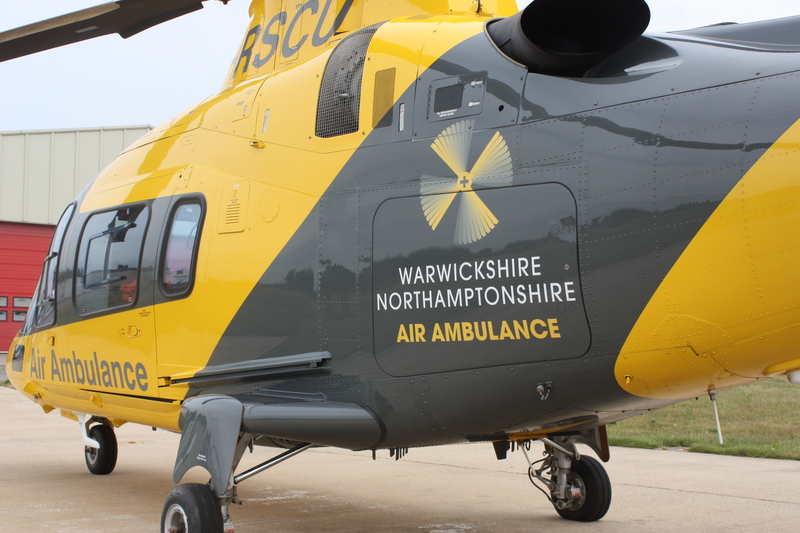 A rapid response paramedic and an ambulance initially attended the scene to treat the patient, and were then joined by the Warwickshire and Northamptonshire Air Ambulance with a trauma paramedic and Doctor on board. A West Midlands Ambulance Service spokesman said: “Ambulance crews arrived to find a 15 year old girl with series leg injuries after being struck by a car whilst attempting to cross the road. “Paramedics treated the girl for her injuries at the scene and then she received further advanced trauma care in the land ambulance from the medics from the Air Ambulance crew, including pain relief and sedation. “Once the girls condition was stabilised she was transferred by land ambulance to University Hospital Coventry and Warwickshire for further treatment. Sunday 19th April 2015 – 7.55pm – Claire Brown. 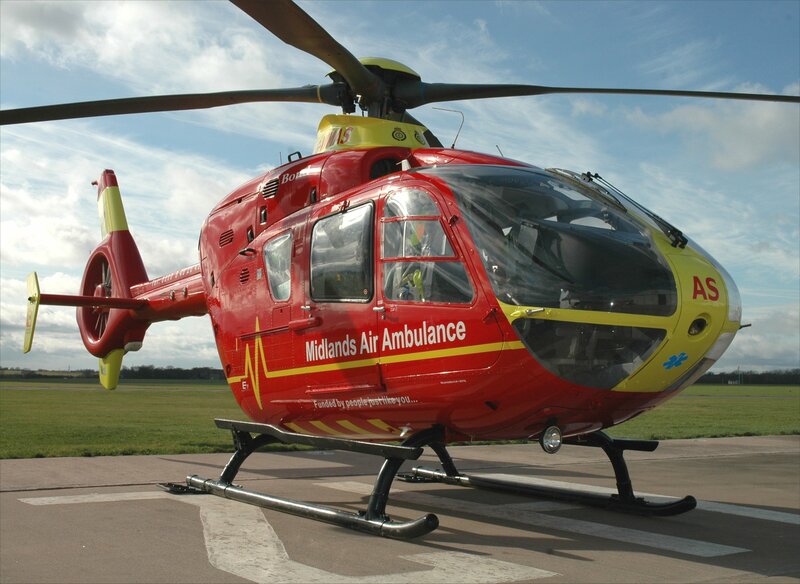 A man sustained a head injury and fractured collarbone after falling from a motorbike in Wolverhampton this afternoon. West Midlands Ambulance Service was called to a dirt track off Blackhalve Lane in Wolverhampton at around 3.15pm (Sunday). Two ambulances, the Midlands Air Ambulance from Cosford with a MERIT trauma doctor on board and the Hazardous Area Response Team were sent. A West Midlands Ambulance Service spokeswoman said: “A passer-by was flagged down to call 999 after children reported a motorcyclist had injured himself nearby. Sunday 19th April 2015 – 1.00pm – Claire Brown. A man who collapsed in cardiac arrest in Birmingham City Centre last night was given advanced life support at the scene by ambulance staff and medics. The incident happened near to the corner of Broad Street and Granville Street, close to Sainsburys Local, at 8.00pm (Saturday). An ambulance, a responder paramedic and medics from the West Midlands Central Accident Resuscitation Emergency (CARE) team attended the scene. A West Midlands Ambulance Service spokeswoman said: “When ambulance staff and medics arrived they found a man who had stopped breathing and was in cardiac arrest. Saturday 18th April 2015 – 7.30pm – Claire Brown. 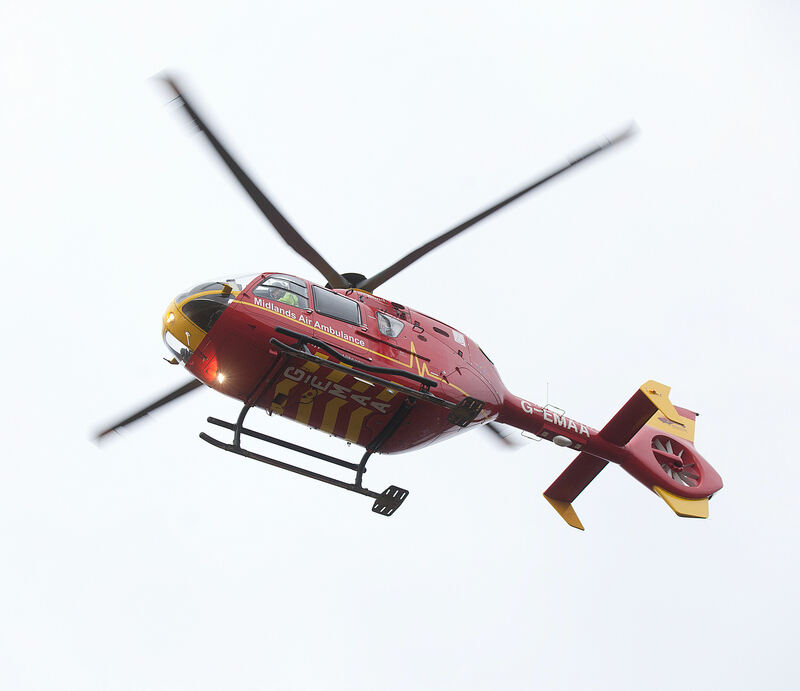 A man who fell 20 feet from the roof of a property has been airlifted to a major trauma centre by ambulance staff in Staffordshire this afternoon. 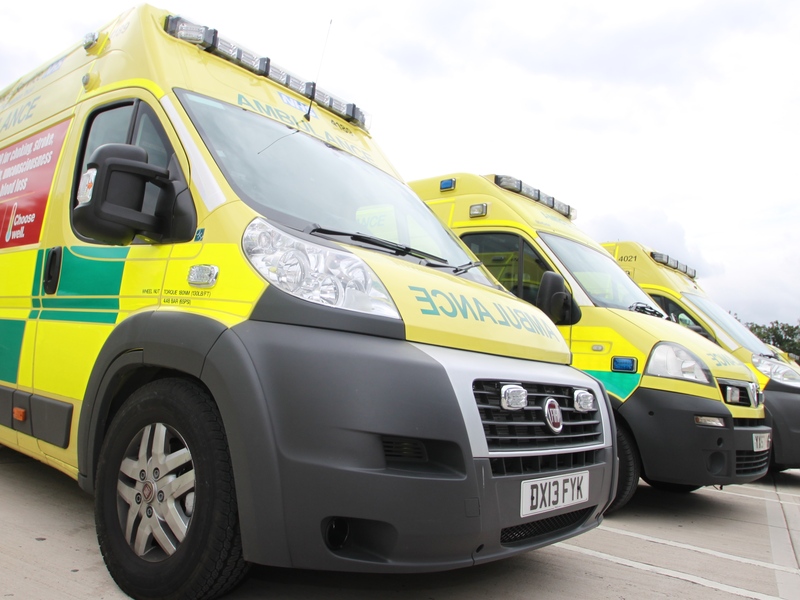 West Midlands Ambulance Service was called to Anslow Road in Hanbury, Burton-on-Trent at around 12.50pm earlier today. A responder paramedic and the Midlands Air Ambulance from Tatenhill airbase were sent to the scene. A West Midlands Ambulance Service spokeswoman said: “The man was fully conscious and breathing following the 20 feet fall from a roof landing onto a concrete floor. Upon assessment by ambulance staff they found he had sustained a suspected pelvic injury and an injury to his right arm. Friday 17th April 2015 – 8.45pm – Claire Brown. A woman has received trauma care by ambulance staff and a doctor before being airlifted to hospital after falling from a horse in Shropshire. West Midlands Ambulance Service was called to a property on the A442 in Quatt, Bridgnorth shortly after 4.30pm this afternoon (Friday). An ambulance, a community first responder, a community paramedic and the Midlands Air Ambulance from Cosford with a MERIT trauma doctor on board attended the scene. A West Midlands Ambulance Service spokeswoman said: “The woman was riding a horse when she reportedly fell from the animal. “Ambulance staff arrived to find the woman conscious and breathing but in considerable pain. Upon assessment they found she had sustained a suspected fractured pelvis. The woman was given pain relief before ambulance staff and the medic immobilised her to prevent further movement of her pelvis. Friday 17th April 2015 – 12.00noon– Claire Brown. 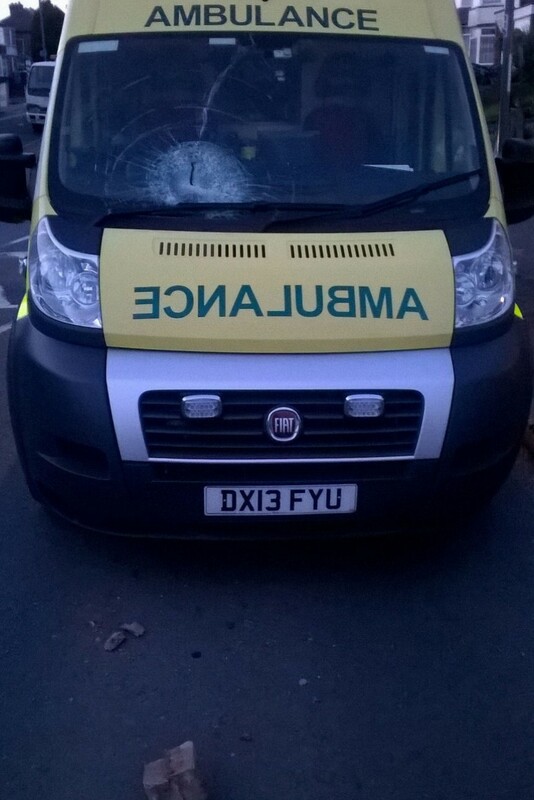 Paramedics on a 999 call had the windscreen of their ambulance smashed with a brick as they treated a patient in Birmingham in the early hours. 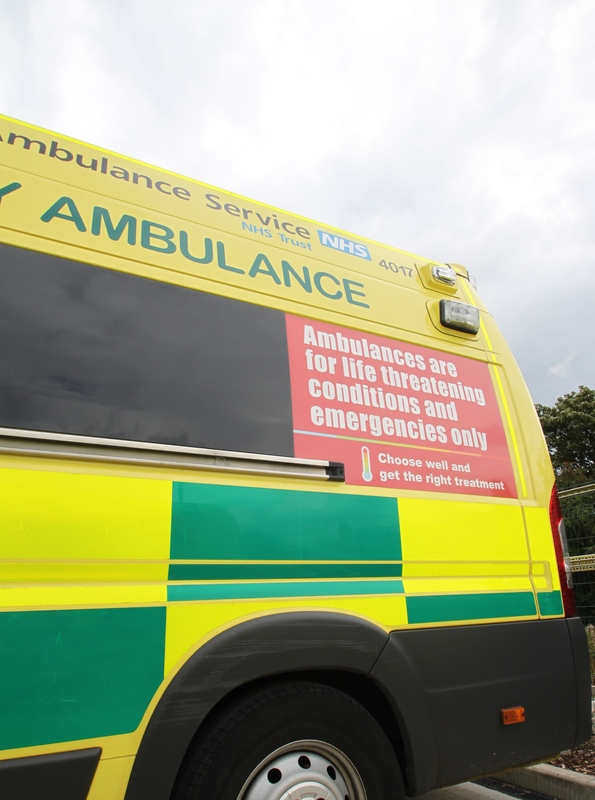 A West Midlands Ambulance Service crew were treating a patient with severe abdominal pain in a property on Chipperfield Road in Hodge Hill at 4am earlier today. When the paramedics returned to their vehicle to take the patient to hospital they discovered that their windscreen had been smashed with a brick. A second ambulance had to be sent to the scene to take the patient to hospital. 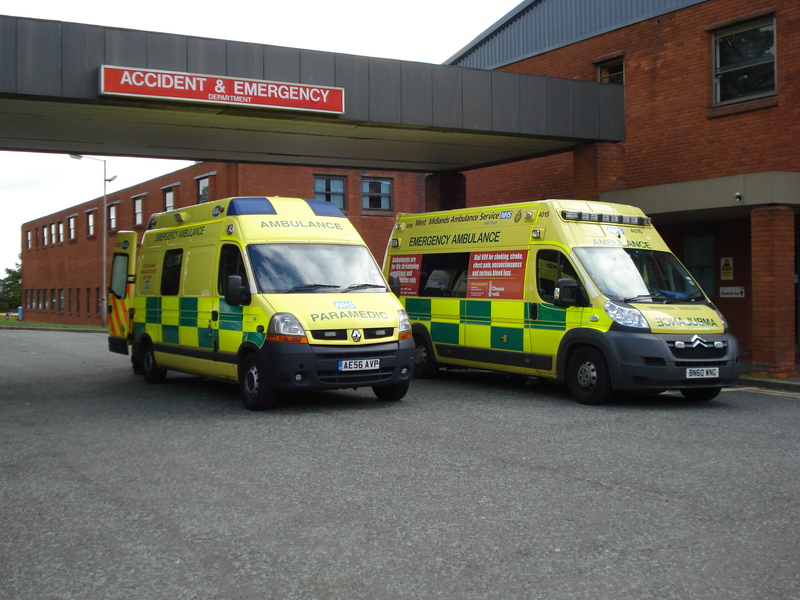 Nathan Hudson, the Trust’s General Manager for Birmingham, said: “This is an incredibly disappointing case which not only delayed a patients’ onward care in A&E but also means we have an ambulance off the road and unable to respond to 999 calls whilst it’s being repaired. Steve Elliker, the Trust’s Head of Security and Safety, said: “We have reported the incident to West Midlands Police and are working closely with them. I would urge anyone who has any information about this senseless act to contact West Midlands Police so that we can bring the perpetrator(s) to justice. “Equally I believe it’s important to make the public of the West Midlands aware that any criminal damage to an ambulance is a drain on public funds”. Friday 17th April 2015 – 10.00am – Claire Brown. A community centre is the beating heart of one Solihull district in more ways than one thanks to a smart new addition. 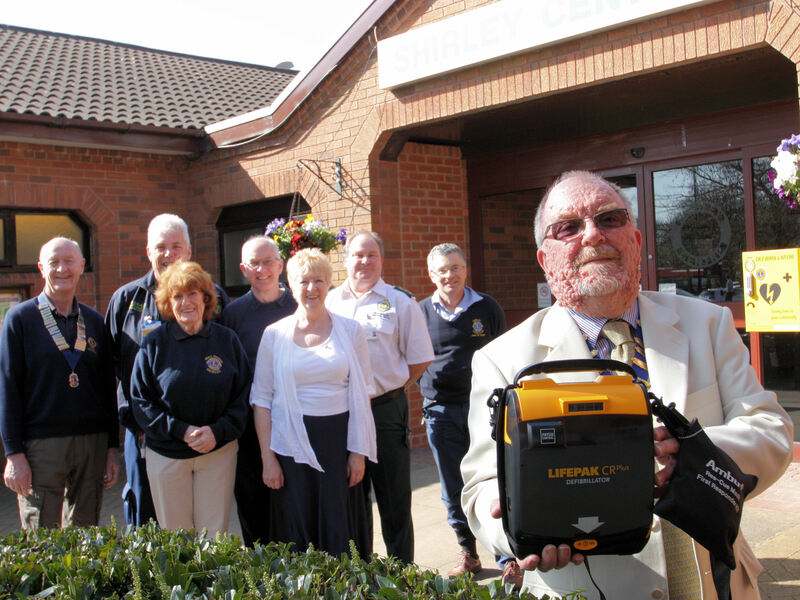 The Shirley Centre, located on the Stratford Road in Shirley, Solihull, is now home to a community public access defibrillator (CPAD), a device used to help restart the heart of someone in cardiac arrest. The defibrillator is in a secure yellow box on the front of the building and is easily accessible in an emergency. 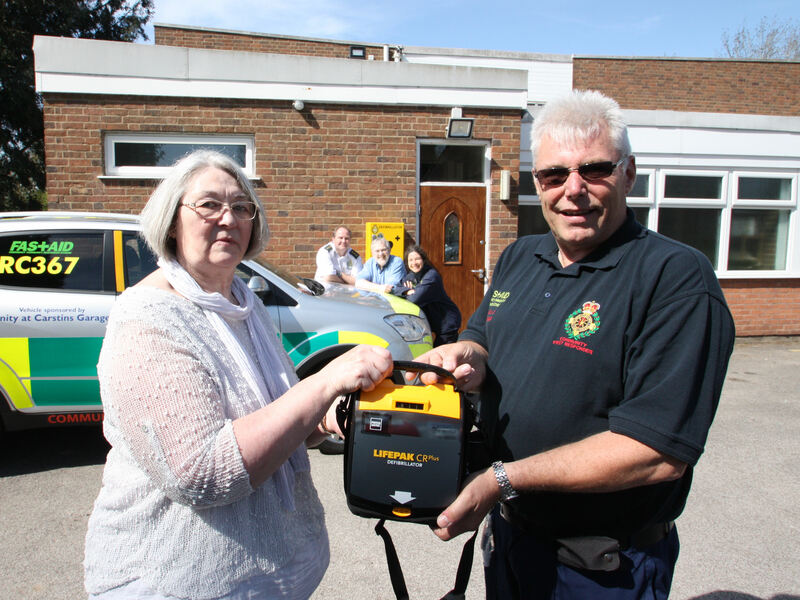 The life-saving device was funded by West Midlands Ambulance Service, the secure box was purchased by Shirley Lions and the venue was sourced by a local Fastaid Community First Responder. 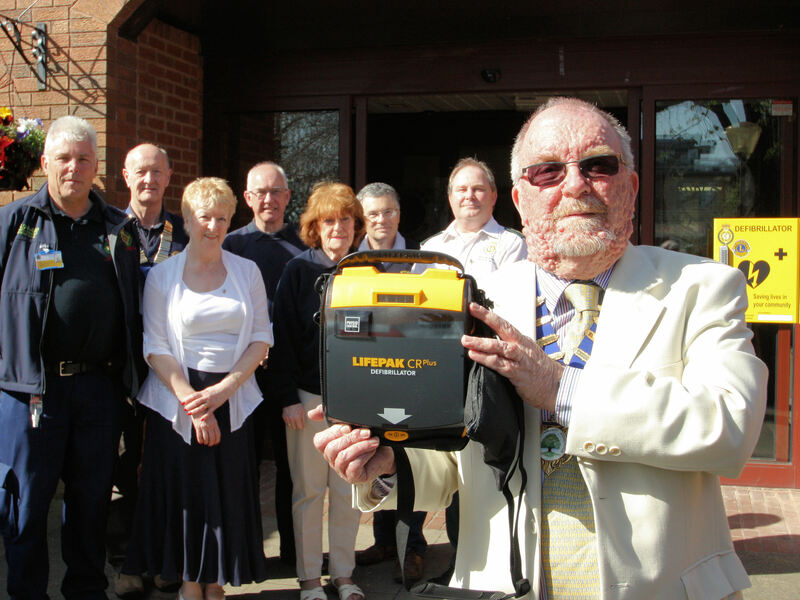 Group photograph (left to right): Jeff Way Fastaid Vice Chair, Ken Barker, President of Shirley Lions, four members of Shirley Lions, Andy Jeynes WMAS Community Response Manager and Alan Bailey Chairman of the Shirley Community Association holding the defibrillator. Thursday 16th April 2015 – 9.00pm – Claire Brown. 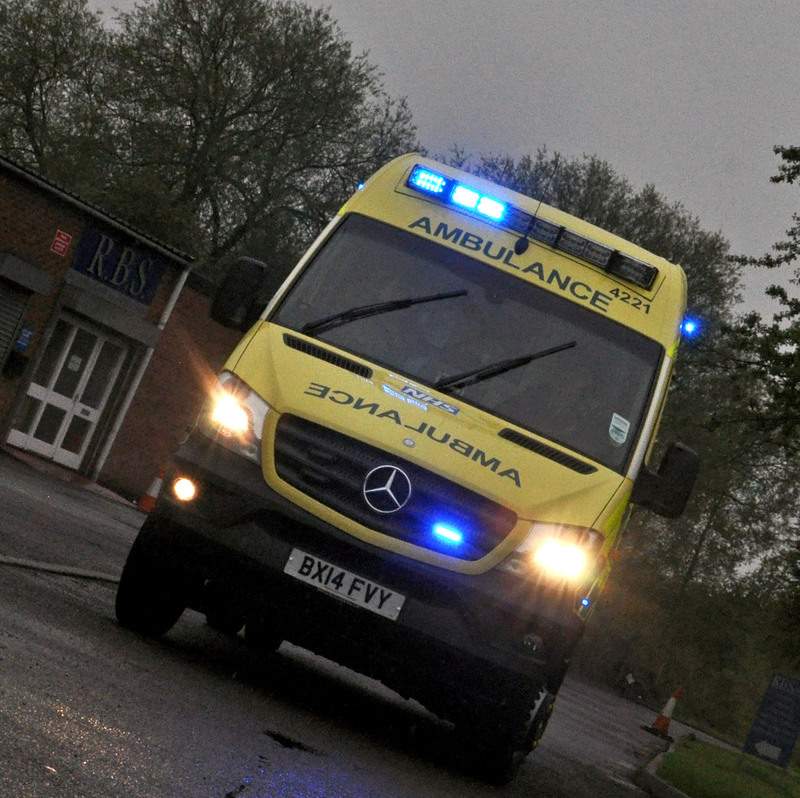 A man who was playing golf in Solihull earlier today has been rescued by the ambulance service after tumbling down a steep embankment. 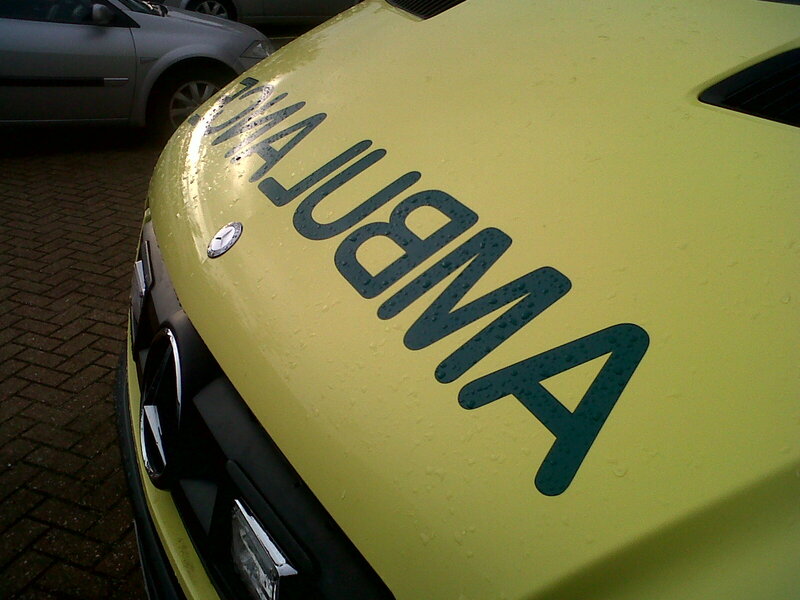 West Midlands Ambulance Service was called to a golf club on the Warwick Road in Knowle at about 3.30pm (Thursday). An ambulance crew, a paramedic area support officer, two community paramedics and the Trust’s Hazardous Area Response Team attended the scene. A West Midlands Ambulance Service spokeswoman said: “The man had been playing golf with his wife in a competition when he accidently fell down a 35 feet embankment. The man hit his head on the way down and narrowly avoided falling into the lake at the bottom of the bank. “Due to the difficult and precarious location, paramedics from the Trust Hazardous Area Response Team were called to help reach the patient. The man was assessed and found to have sustained a nasty head injury, lacerations to his face and a black eye. Whilst the man was being administered pain relief and first aid, ambulance staff had to hold onto the man to prevent him from slipping into the lake. “Once the man was stabilised he was placed into a multi integrated body stretcher (MIBS); a robust material stretcher that works by securely wrapping around the patient to immobilise them and has carry handles to lift and move the patient. Thursday 16th April 2015 – 1.00pm – Claire Brown. 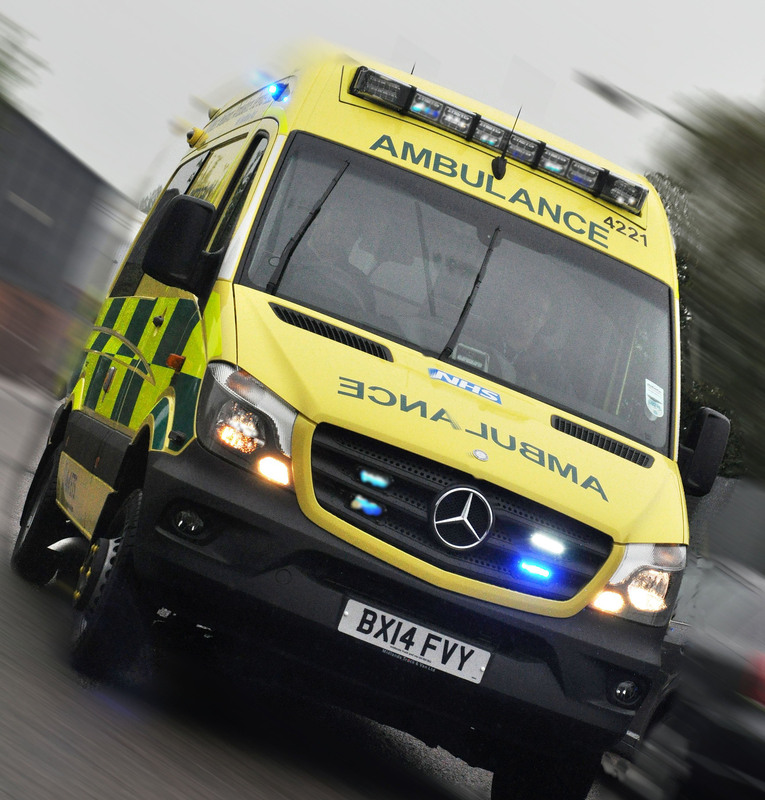 A motorcyclist has been treated at the roadside by ambulance staff after suffering a fractured leg following a collision with a car in Solihull. West Midlands Ambulance Service was called to the junction of Warwick Road and Grange Road shortly before 10.30am this morning (Thursday). An ambulance, a community paramedic and a paramedic area support officer attended the scene. A West Midlands Ambulance Service spokeswoman said: “The man had reportedly been knocked off his bike following the collision with a car. The biker, a 20-year-old, was assessed by ambulance staff and was found to have sustained a fractured leg and a suspected pelvic injury. “The man was given pain relief to stabilise his condition before the ambulance staff carefully immobilised him onto a spinal board and neck collar. His leg and pelvis were also splinted. The man was then taken to Heartlands Hospital. Wednesday 15th April 2015 – 7.20pm – Jamie Arrowsmith. 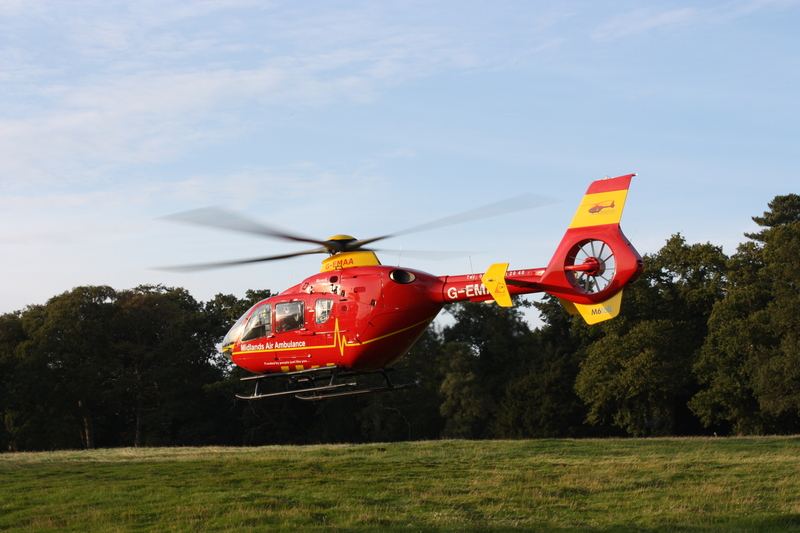 A cyclist has been airlifted to hospital after suffering a serious leg injury following a collision with a tree in a Herefordshire wood this afternoon. The incident occurred in an area off woodland near to St Lawrence Church on Church Road in Weston-under-Penyard shortly after 1pm. West Midlands Ambulance Service sent an ambulance, a community paramedic in a rapid response vehicle and the Midlands Air Ambulance from Strensham to the scene. A West Midlands Ambulance Service spokesman said: “Crews arrived to find a cyclist who had collided with a tree. The man, who had managed to get himself onto a path in the wood despite his injury, was spotted by a passer-by who stopped to help him. “The cyclist, a man in his 20s, was treated for a lower right leg fracture by ambulance staff. He was given pain relief initially before the team carefully stabilised his leg to prevent further movement of the fracture. Ambulance staff used a scoop stretcher to carry the man out of the woods, and to the awaiting air ambulance which had landed in a nearby field. Wednesday 15th April 2015 – 2pm – Jamie Arrowsmith. A woman had to be cut free from her vehicle following a two-car road traffic collision in Codsall this morning. The incident left both cars with front end damage and resulted in two patients being transported to New Cross hospital after receiving treatment from ambulance staff. West Midlands Ambulance Service sent two ambulances and a paramedic area support officer to the incident which occurred at 11am at the junction of the A41 and A464. A West Midlands Ambulance Service spokesman said: “On arrival, crews discovered two cars with front end damage and it quickly became evident that one of the patients, a woman in her 60s, was going to have be helped out of her vehicle. “Ambulance staff worked closely with the fire service to cut the woman, who was a passenger, out of the car. She was immobilised with the use of a scoop stretcher and treated for neck and back pain. The driver of the car was uninjured. “The driver of the second car, a woman in her 60s, managed to free herself from the vehicle. She was also immobilised with the use of a scoop stretcher and treated for minor leg injuries and chest pain. Wednesday 15th April 2015 – 11.20am – Jamie Arrowsmith. 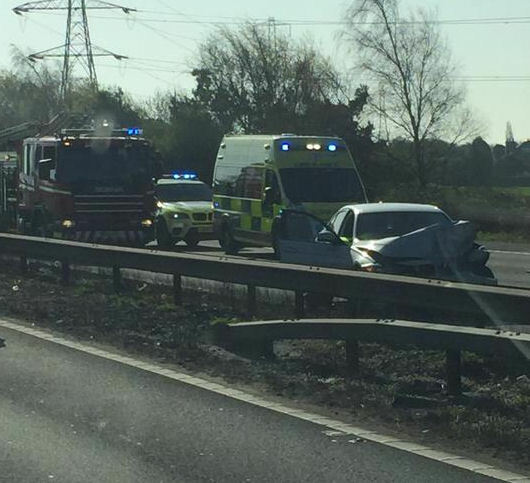 The M6 motorway at junction three has been partially closed for the second time in 12 hours following a two-car road traffic collision this morning. The collision left two people needing treatment from ambulance staff, one of whom had to be cut free from his vehicle. Both sides of the carriageway were shut last night due to concerns about a man’s safety who was on a bridge over the motorway. Thankfully, the man was uninjured in the incident. Today’s incident resulted in the northbound carriageway being shut at junction three, leading to significant traffic delays in the area. West Midlands Ambulance Service was called to the scene at 8.34am and sent two ambulances and a paramedic area support officer to the scene. A West Midlands Ambulance Service spokesman said: “Crews arrived to find two cars that had been involved in a collision, leading to a heavy build-up of traffic on the motorway. One of the cars had suffered front end damage and one had suffered rear end damage, both had single male occupants. “The car with rear end damage was being driven by a man in his 50s. Crews had to work carefully with the fire service to free the man from his vehicle, which took approximately 30 minutes. “He was immobilised with the use of a scoop stretcher and treated for neck injuries. Pain relief was administered on scene before the man was taken to University Hospital Coventry and Warwickshire. Tuesday 14th April 2015 – 11pm – Jamie Arrowsmith. 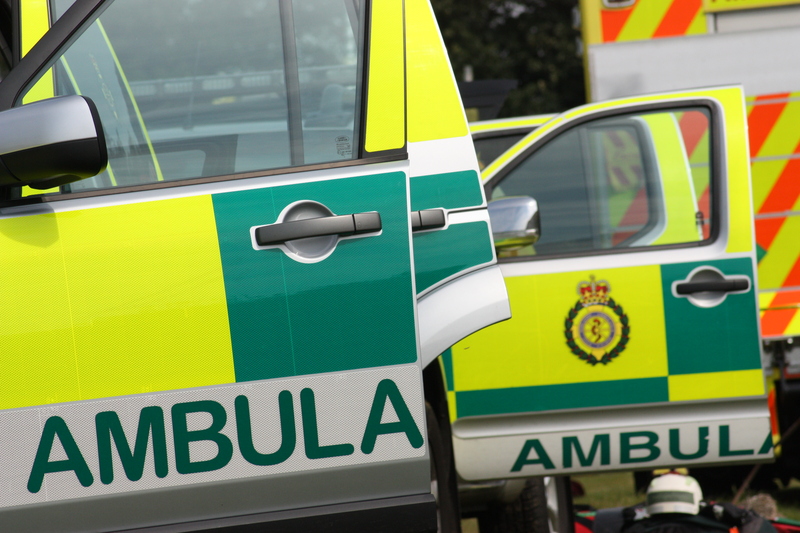 A motorcyclist has died following a crash in Albrighton tonight. 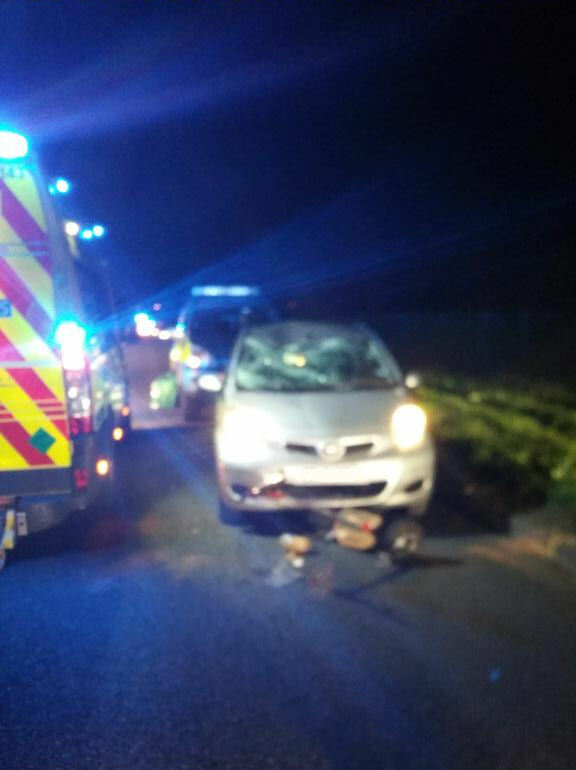 The incident occurred on the A41, near to the junction with County Lane shortly after 7.30pm. An ambulance, a rapid response paramedic, a paramedic area support officer and a MERIT trauma doctor attended the scene. 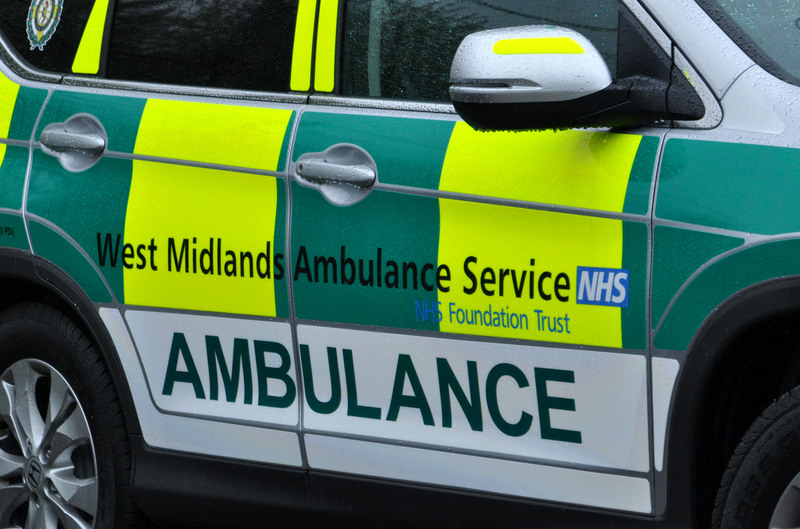 A West Midlands Ambulance Service spokesman said: “Crews arrived to find a man in cardiac arrest following a collision between a motorbike and a car. “A number of off duty medics were already on scene and had commenced CPR. “Ambulance crews then commenced advanced life support, but unfortunately it quickly became apparent that nothing could be done to save the man and he was confirmed dead at the scene. Tuesday 14th April 2015 – 12.45pm – John Hawker. A motorcyclist has received trauma care from medics at the scene of a crash in Shrewsbury this morning. 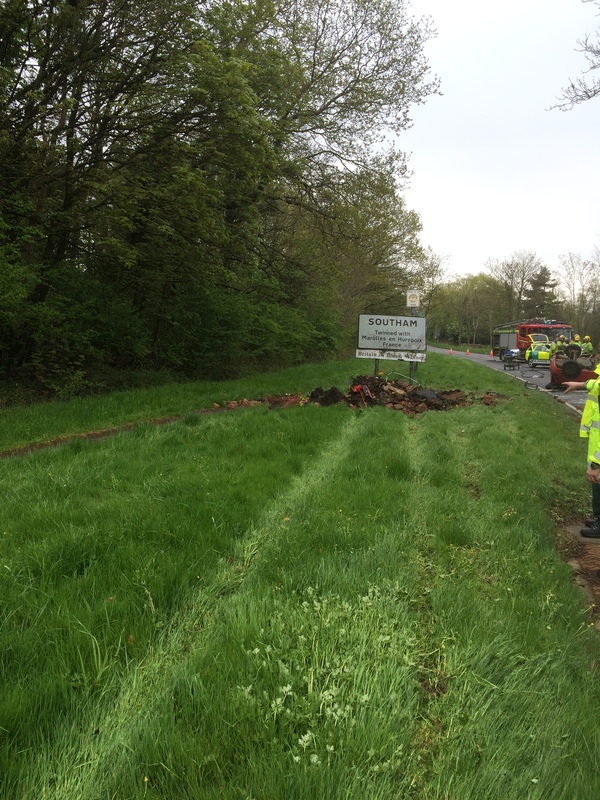 The crash occurred on the A53, just before Upper Astley, Shrewsbury at around 8.55am. An ambulance, a rapid response vehicle and the Midlands Air Ambulance from Cosford attended the scene. A West Midlands Ambulance Service spokesman said: “Crews arrived to find a motorcycle and a car that are believed to have been in a serious collision. “The man riding the motorcycle had suffered serious abdominal, leg and back injuries. The man, believed to be in his late 30’s received emergency treatment by paramedics, and also further treatment by the air ambulance crew, including a specialist trauma doctor. 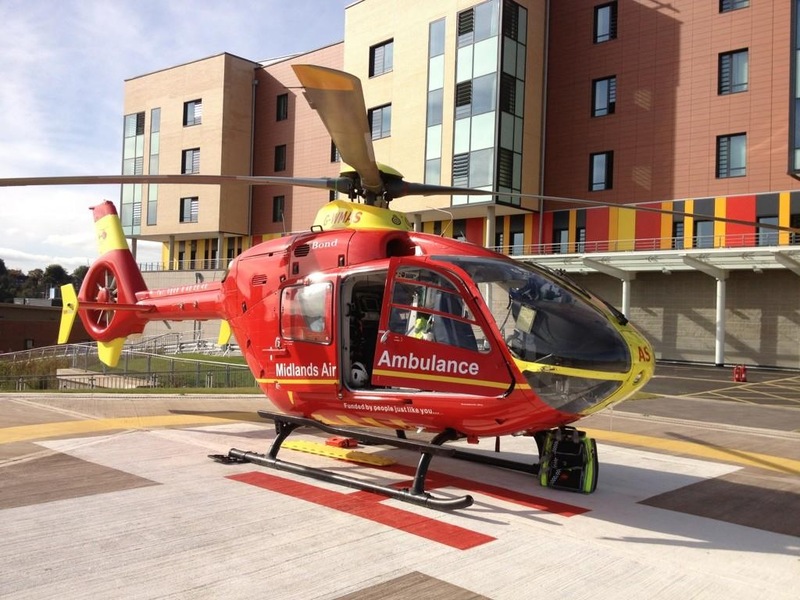 “Once the patient’s condition was stabilised and he had received pain relief, the man was airlifted to Royal Stoke University Hospital Major Trauma Centre for further emergency treatment. “The hospital had been pre alerted to the patient’s injuries and a trauma team was on standby awaiting his arrival. Monday 13th April 2015 – 6.50pm – Murray MacGregor. Two men have suffered serious injuries while two others are lucky to be alive after a crash that saw metal pipes go through the windscreen of a lorry. The crash involving a ‘panel’ van and a recovery lorry took place at just before 4.30pm on Northfield Road in the Harborne area of Birmingham. A West Midlands Ambulance Service spokesman said: “On arrival, crews found the two vehicles had collided head on causing considerable damage to both vehicles. The engine of the panel van had been shifted by the force of the collision. “The pipework from the roof of the panel van had gone through the windscreen of the recovery lorry, narrowly missing the driver and passenger, who were both estimated to be in their 40s. “The driver of the recovery lorry was disorientated and understandably very shaken by what had happened. Due to his condition he was immobilised using a neck collar and spinal board and taken to City Hospital for further assessment. “The passenger who had suffered only minor injuries went to the same hospital. “The two men in the panel van had suffered more serious injuries. The driver had potential internal injuries after the steering wheel was bent during the collision. The man, who was estimated to be in his 40s was immobilised before being taken to the major trauma centre at the Queen Elizabeth Hospital in Birmingham. “The passenger in the van, a man estimated to be in his 20s was treated for a dislocated hip. He too was immobilised before being taken to the same hospital. Monday 13th April 2015 – 4.45pm – Steve Parry. Two people have been taken to hospital following a road traffic collision on the M6 motorway this afternoon. Two ambulance crews were called to a location between Junction 8 and 9 northbound at just after 3.30pm. A West Midlands Ambulance Service spokesman said: “A man believed to be in his twenties and a woman in her fifties were treated at the scene by ambulance crews. “The patients were treated for minor injuries and transferred to Walsall Manor Hospital as a precautionary measure for further assessment. Sunday 12th April 2015 – 6.05pm – John Hawker. 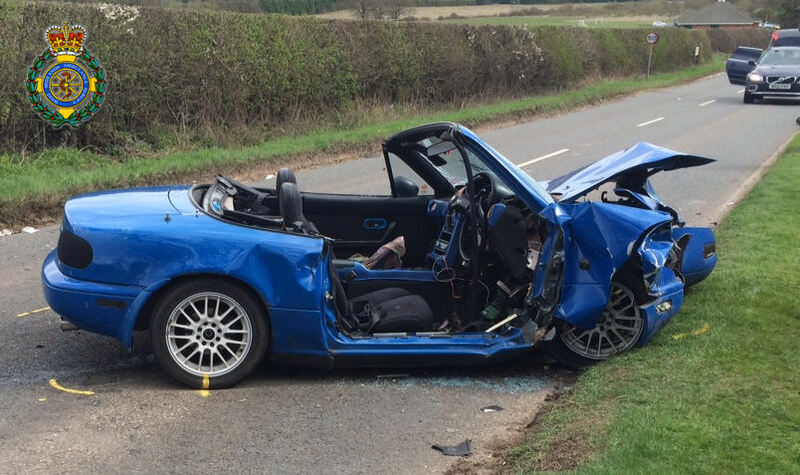 The driver of a convertible sports car was trapped for an hour after a two car crash in Leamington Spa this lunch time. 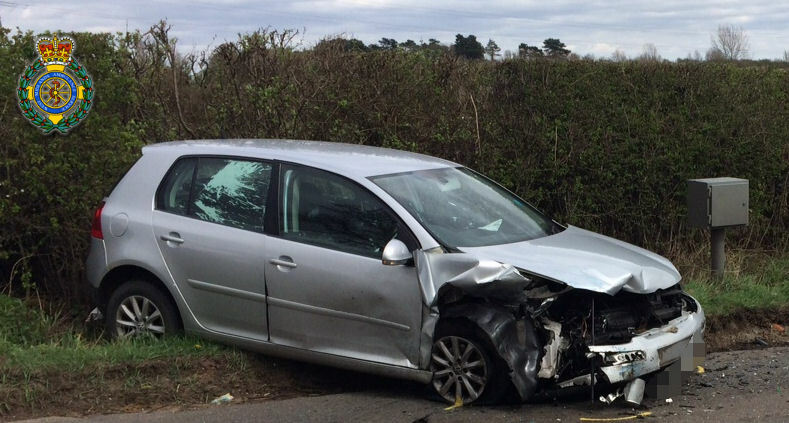 The crash occurred on Harbury Lane, near Mallory Park Hotel at around 12.15pm. Three ambulances, a rapid response vehicle, a paramedic officer and the Warwickshire and Northamptonshire Air Ambulance attended the scene. A West Midlands Ambulance Service spokesman said: “Crews arrived to find a convertible sports car and a second car that had been in a significant crash. “The driver of the convertible, a man believed to be 24 years old, suffered serious pelvic, rib and facial injuries. 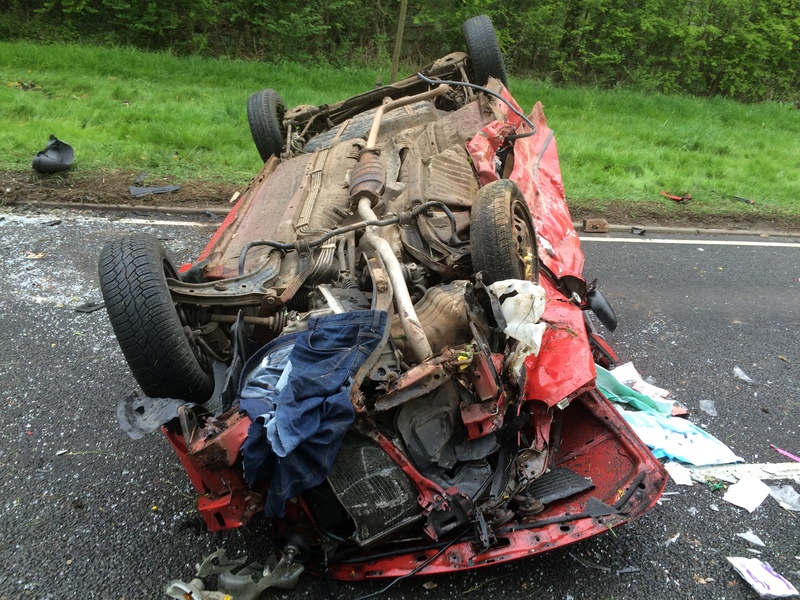 He received emergency treatment whilst trapped in the car and was extricated with the assistance of the fire service. “Once released, the man received further treatment before being transferred by land ambulance to University Hospital Coventry and Warwickshire for further emergency treatment. “The passenger in the same car, a woman believed to be 25 years old, suffered serious back injuries and also suspected internal injuries. She also received emergency treatment whilst trapped for around 20 minutes before being released. The woman received further treatment before being transferred by land ambulance to the same hospital. “The passenger travelling in the second car, a woman believed to be in her 40’s, suffered rib, arm and leg injuries. She received emergency treatment at the scene and her condition was stabilised. The woman was airlifted to University Hospital Coventry and Warwickshire for further emergency treatment. “The man driving the second car, believed to be in his 40’s, suffered shoulder injuries. A girl who was also a passenger, believed to be 2 years old, was travelling in a child safety seat and was checked over at the scene but appeared to have escaped uninjured in the crash. Both were transferred to the same hospital for further assessment. Saturday 11th April 2015 – 5.45pm – John Hawker. Three people travelling in a car have been seriously injured after it collided with the back of a lorry in Birmingham this lunchtime. 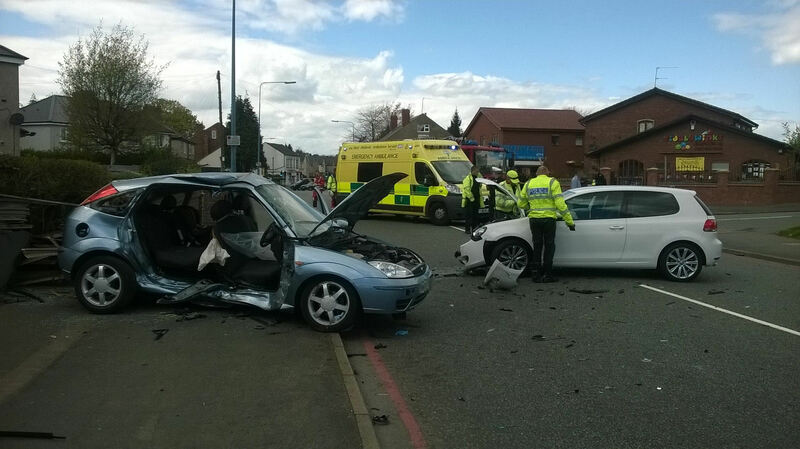 The crash occurred on Walsall Road, Perry Barr at around 12.30pm. Three ambulances, a rapid response vehicle, a paramedic officer and the Midlands Air Ambulance from Cosford attended the scene. A West Midlands Ambulance Service spokesman said: “Crews arrived to find a car that had been in a serious collision with the back of a lorry. “The three people travelling in the car had all suffered serious injuries and were trapped in the vehicle. “The man driving the car suffered serious facial, chest and leg injuries and was extricated by ambulance and fire service staff. He received emergency treatment at the scene by medics including being anaesthetised by the trauma doctor from the Air Ambulance. “The man was then transferred by land ambulance to Queen Elizabeth Hospital Major Trauma Centre receiving further treatment whilst on route. A trauma team were on standby awaiting his arrival. Unfortunately the man’s injuries were considered life threatening. “The man travelling in the passenger seat, believed to be in his early 20’s, suffered a suspected broken arm, facial and back injuries. He also received emergency treatment at the scene whilst being cut from the vehicle. He was trapped for around 30 minutes. “The woman travelling in the back of the car, believed to be in her late teens, received treatment at the scene by medics for a suspected broken leg and also head injuries. “Once both passengers were extricated from the car and their conditions had been stabilised, they were both transferred to Queen Elizabeth Hospital Major Trauma unit for further emergency treatment. Friday 10th April 2015 – 4pm – Steve Parry. 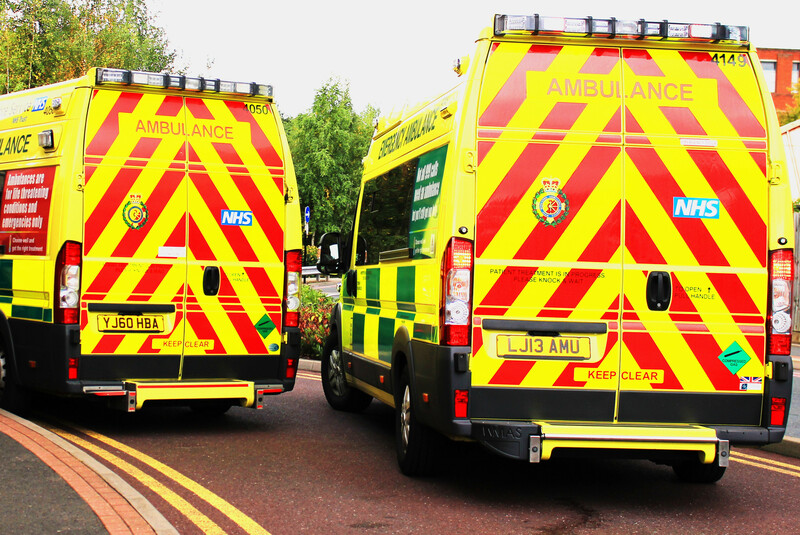 A number of people have been taken to the Royal Stoke University Hospital following three separate road traffic incidents on the M6 in Staffordshire this afternoon. West Midlands Ambulance Service was called to the exit slip road off the M6 junction 16 northbound at just after 2pm. Four ambulances, together with two paramedic officers in rapid response vehicles and two BASIC doctors attended the scene. A West Midlands Ambulance Service spokesman said: “999 callers were advising of an incident near Junction 16. Crews responded to the first incident only to find two further collisions taking place whilst they were treating patients. “In the first incident involving a van and two cars, two patients were treated for minor injuries. They were taken hospital for further assessment and treatment. “Crews were dealing with the first incident when a second collision took place at the same location. Two further patients were treated for minor injuries and also transferred to Royal Stoke University Hospital.